There are three streams of data collection associated with the RMFI data collection, including monitoring plant communities, measuring trail change over time, and observation of human interaction with closed trails. Training is required to participate in these research streams. If you are interested in training to become a RMFI citizen scientist, please email me at ecocitycoloradosprings@gmail.com. The final quarter of the year brings a great diversity of tasks. We host the largest group of volunteers we see all year in the form of 16 college students from UCCS in a field ecology course taught by Dr. Emily Mooney. The effort requires advanced preparation, training, and participation by our veteran citizen scientists. The college students help us to collect end-of-season vegetation data on the two closed social trails in the southern reservoir valley of the Garden of the Gods park. 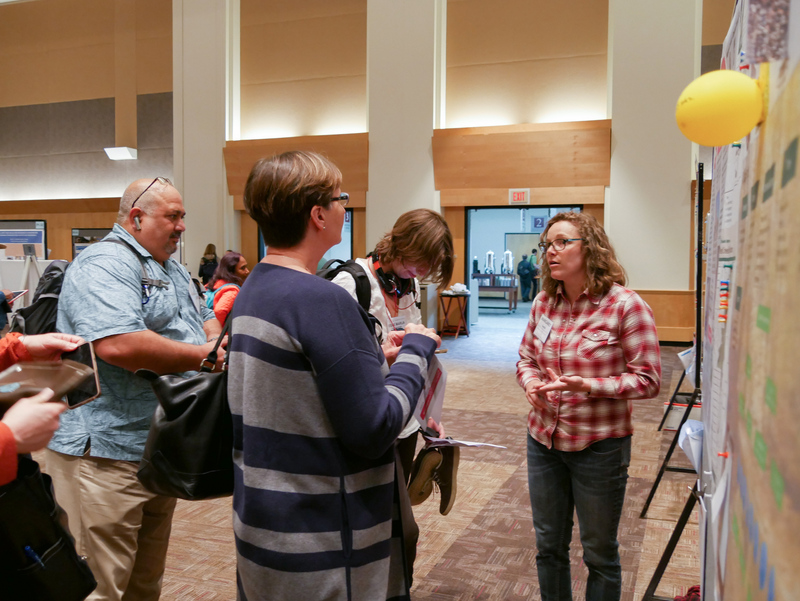 For 2019, we have two other UCCS professors interested in engaging their students in the Citizen Science program. This will greatly increase our data collection possibilities. 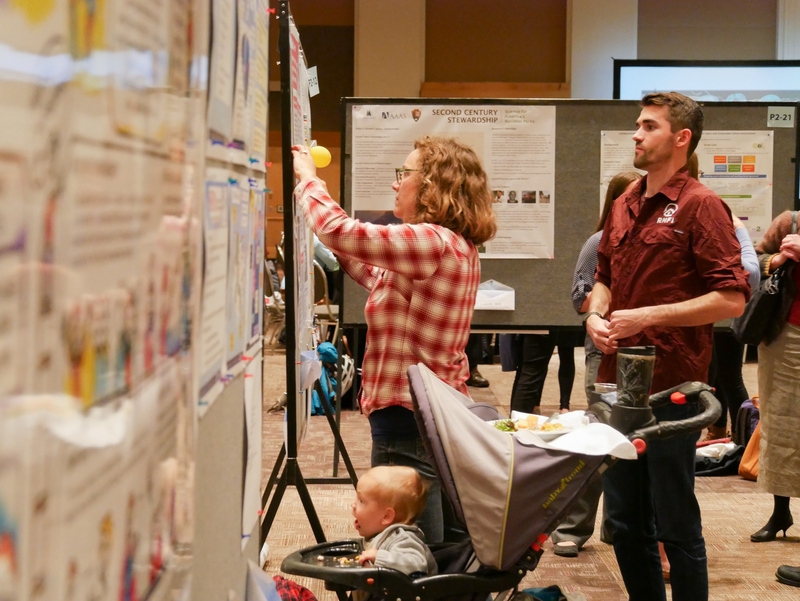 The final quarter also brings lots of data analysis, which was motivated greatly by the acceptance of our poster and my talk to the Rocky Mountain Citizen Science conference in Cody, WY. William Brown, US Veteran, UCCS student, and citizen scientist assisted in the preparation and presentation of the poster. William was awarded a Green Action Fund grant (UCCS) to cover his expenses related to the conference. It was his first academic conference and thus a huge milestone for both RMFI and one of our dedicated volunteers. The poster file is delivered with this invoice. I expanded the list of contacts to whom I send the monthly blog post. This is enhancing communication and recruitment to the Program. We have several new citizen scientists in training. 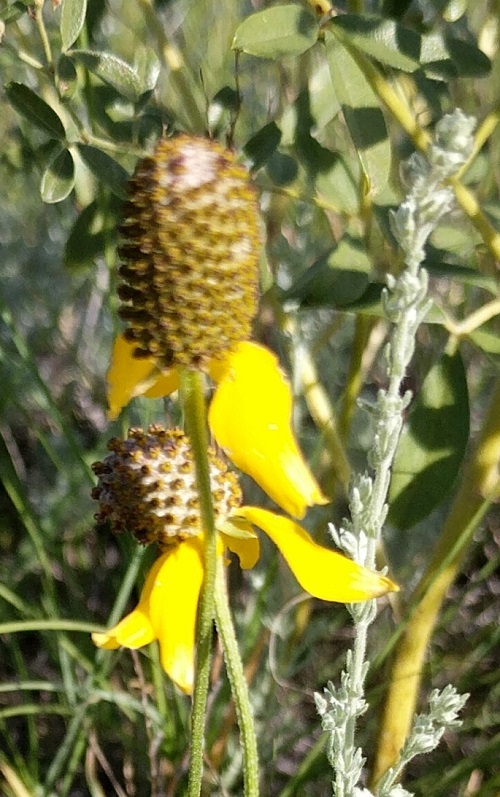 I became the Colorado Native Plant Society southeast chapter chair. I already planted the seed to initiate future collaborations with this organization, which includes a statewide membership of citizens, academic, and public land agency professionals. I look forward to working with RMFI in 2019. I graduated from my PhD program; I am excited to devote even more time to this project. Thank you for tolerating me through this very, very challenging push towards graduation. Without your support throughout the years, my academic journey would have lacked grounding in a local, place-based community of dedicated natural resource stewards. Please click on the links below to expand our Rocky Mountain Citizen Science conference poster and talk slides. Please contact me if you have any questions. When we get into the field, students need to get their bearings and work through the measurements (RMFI Citizen Science Program- Student Document) several times to become efficient data collectors. They work in small teams to identify how many different plants are present in the quadrat (richness). Working together builds consensus and increases data reliability. Students attempt to identify the species in each quadrat. This is an extreme challenge even for me. I haven’t found anyone to help who knows more than I do. 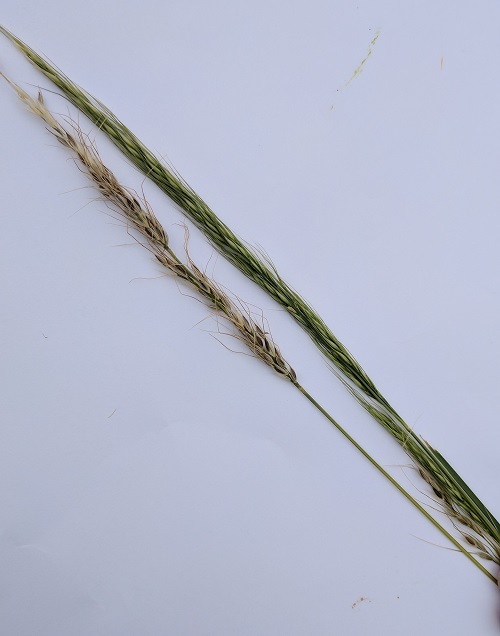 These native species, all grasses, are hard to identify when mature and proving almost impossible to identify when they are only a few years old. I planted these seeds when I was a RMFI Field Instructor in 2015 with our volunteer crews. 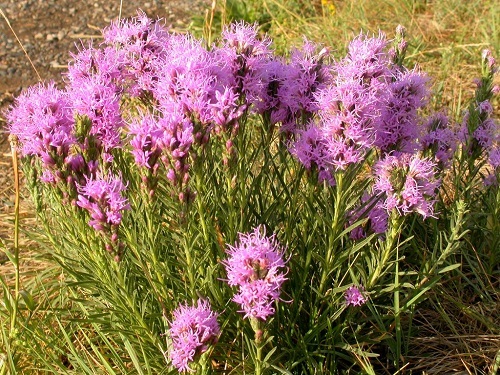 Any plant in the trail is no more than three years old. I created a Basic Reclamation Mix Plant Guide-2018 for the students which helped quite a bit. We also used the referent plant community outside of the trail for guidance. We have a narrow scope of species to choose from because this study area was seeded with only 10 native species found in the Garden of the Gods. 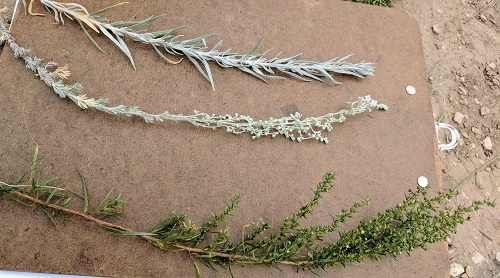 Despite the limited species diversity possible, the plant specimens within the trail may not show all the characteristics for a reliable identification. 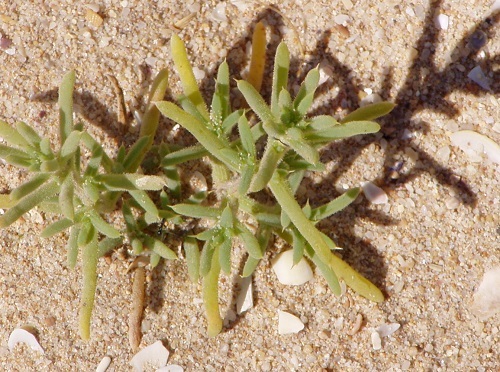 In that case, we look to the adjacent plant community to find look-alikes. 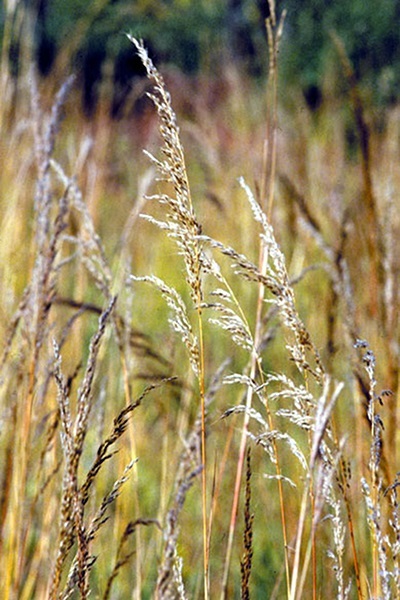 It is helpful in the fall that different grasses senesce to different colors, curliness, dryness, etc. 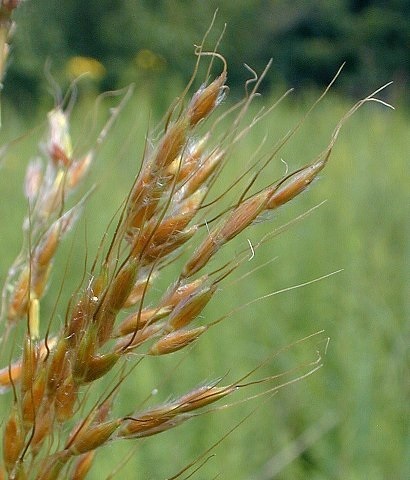 For example, the switchgrass fades to a bright yellowing-orange color with broad leaves. 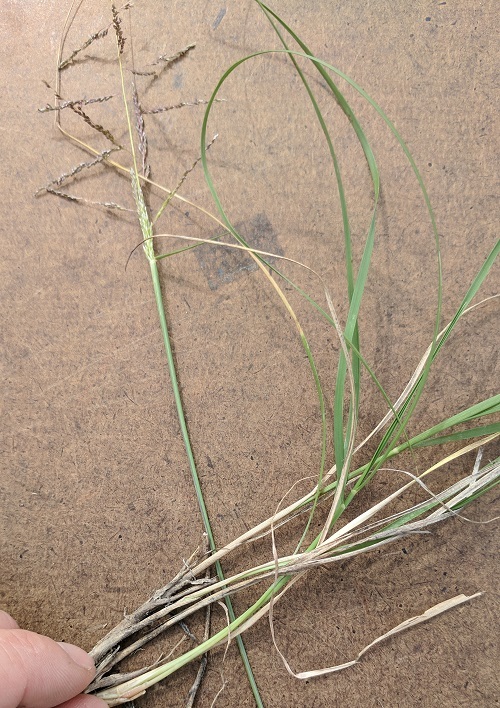 If you see a baby switchgrass in the trail with no seed head, it is reassuring to find another one outside of the trail with a seed-head present for a final confirmation that it is in fact switchgrass. 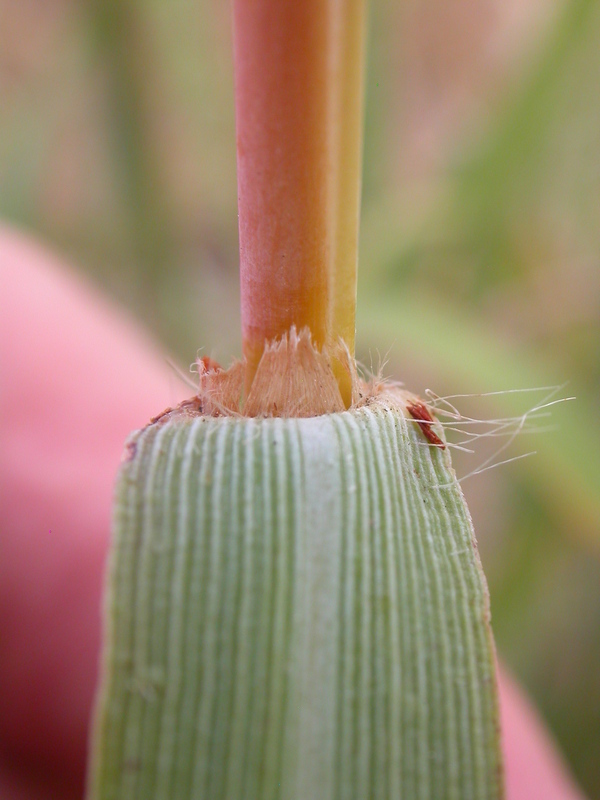 We also use the ligule characteristics to identification grasses. Beyond the active revegetation effort in the first several hundred feet of each closed trail, the revegetation is 100% due to the seeds and vegetative spread of the nearby plant community. 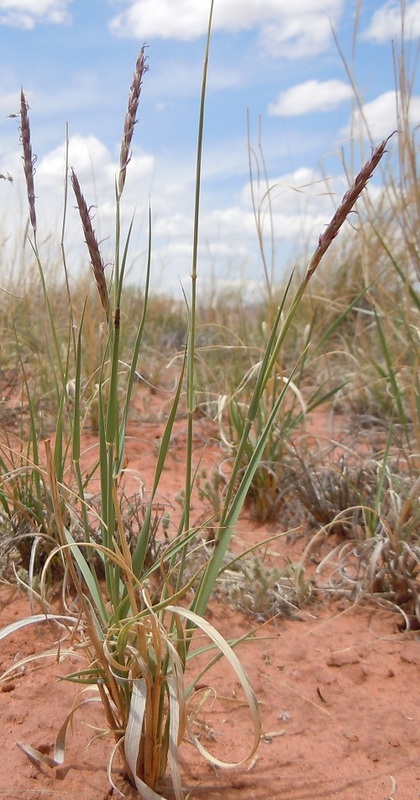 Since the revegetation mix is crafted from the same native species present in the Garden of the Gods, in the passively re-vegetated areas, the species present are still likely to be ones in the Revegetation Plant Guide. Looking to the referent community beyond the trail area is especially important in the hinterlands of each closed trail. At this point, none of the species data collected is publishable, but the richness and cover data are. 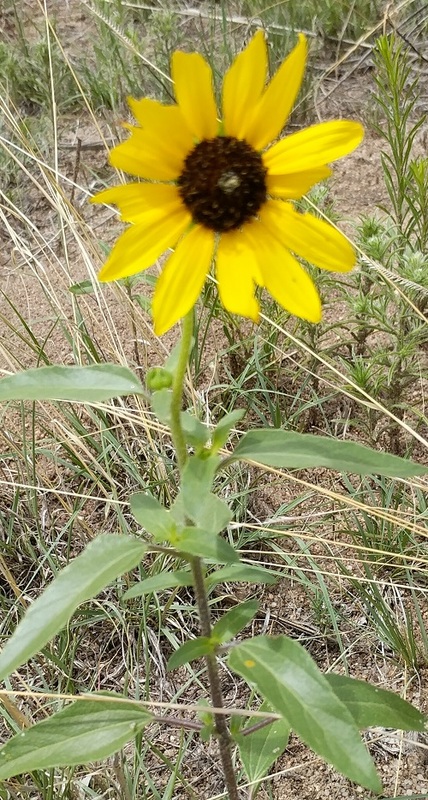 I recently accepted the position of Southeast Chapter President for the Colorado Native Plant Society in hopes of expanding the botanical expertise available to the RMFI Citizen Science Program and other programs like it throughout our region. Another strategy I am currently enacting involves planting these native species in a cold greenhouse environment to develop a research-grade referent plant community. We can study the greenhouse plants and use that to increase our confidence in our field identification. 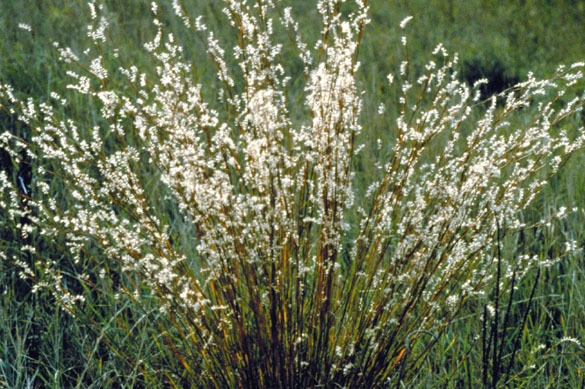 We will also be developing a stock of native plants available for use in active revegetation efforts. 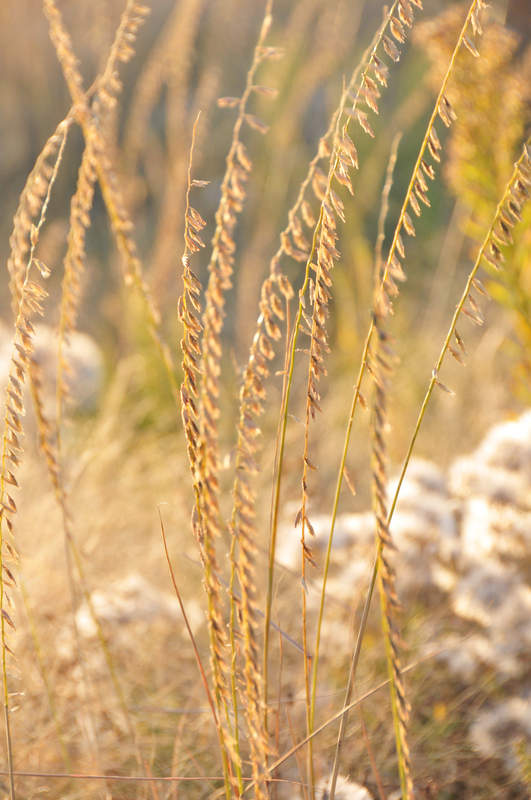 Perhaps in the near future, we can restore landscapes with seeds and locally-grown native plant stock. I am going to take a different route this month and described our scholarly activities. I submitted this abstract to the 2019 Citizen Science Association Conference in Raleigh, NC. I went in 2017 with Jaxon Rickel, the first citizen scientist for the RMFI Citizen Science Program, CC graduate, current conservation worker, former Waldo Canyon restoration monitor for RMFI, and overall amazing person! Jaxon designed the poster and presented it with me. He had never attended an academic conference before. This was an amazing experience for him that resulted in his employment with a bird conservation organization somewhere deep down in Texas. We miss him. I am also especially grateful to Jaxon because he worked on the literature review for my dissertation with me. He will be a co-author on that publication, which we will submit this winter. This year, I hope to bring one or more of our current citizen scientists to the CSA conference. All are welcome! You can not imagine a more enthused, focused, and friendly group of citizen scientists and academic scholars than the community of the Citizen Science Association. And the flowering hardwoods of the southeast…I can’t wait to see that. I also submitted a talk abstract to reveal the results of my dissertation entitled Training citizen scientists for data reliability: A multiple case study to identify themes in current training initiatives. I submitted a talk abstract to the Rocky Mountain Citizen Science Conference in Cody, Wyoming this fall. At this conference, I will present my dissertation research as well. 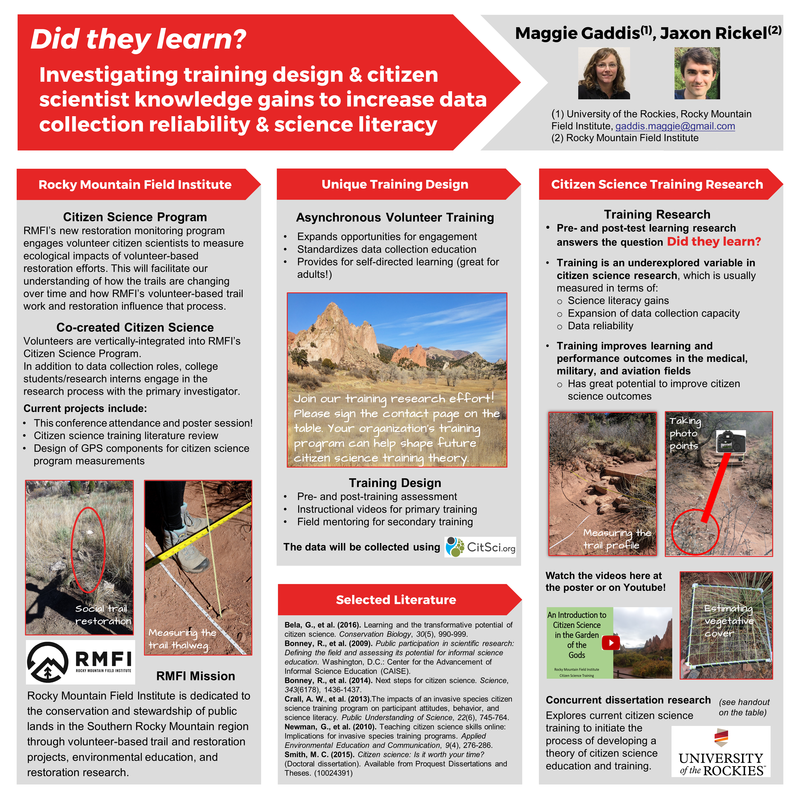 The RMFI Citizen Science poster is also a possibility there, but I would like a student to present the poster and I am not sure I can recruit one by then (prove me wrong!). 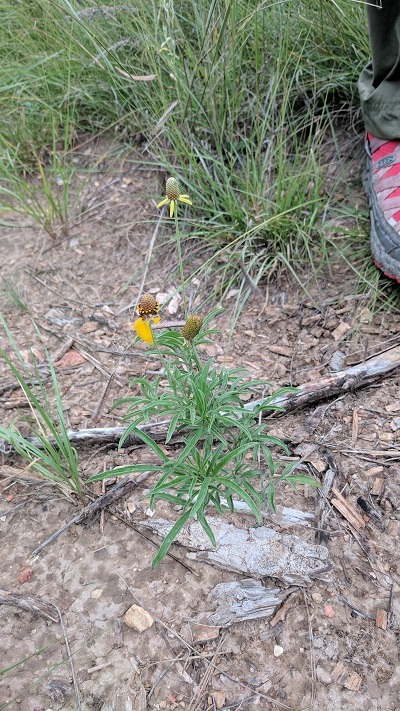 ​The Rocky Mountain Field Institute (RMFI) Citizen Science Program engages citizen scientists in monitoring the ecological restoration of the Garden of the Gods, Colorado, USA. The Garden of the Gods is the largest city park in the United States. Over 3 million visitors enjoy this two-square mile geological wonder. Citizen scientists measure trail shape dynamics over time before, during, and after trail improvement projects. They also measure vegetation dynamics on actively restored closed social trails. They conduct human behavior monitoring to characterize compliance with closed trail indications. 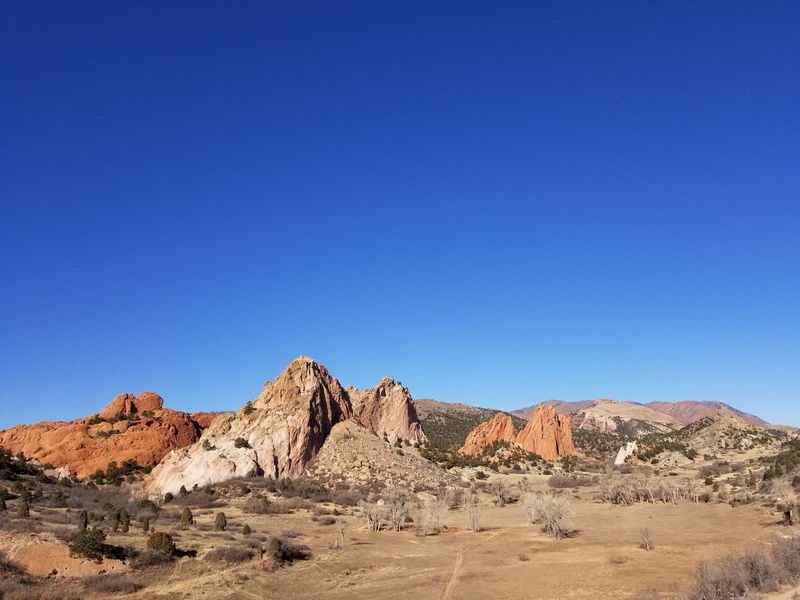 This research informs land managers of the Garden of the Gods and provides scholarly engagement for citizen scientists, many of whom are undergraduate students. This program has a unique training platform involving pre- and post-training evaluation and asynchronous video instruction. 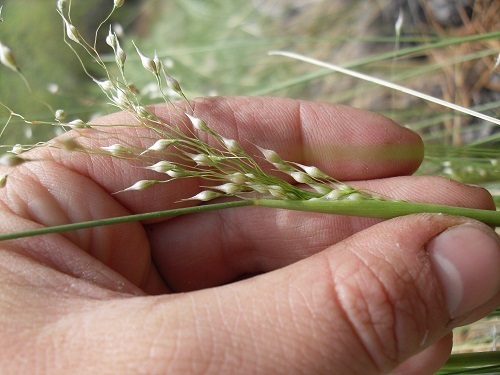 Another layer of this citizen science program is the training research component in which the learning gains of trainees are measured and analyzed in a concurrent education research stream. 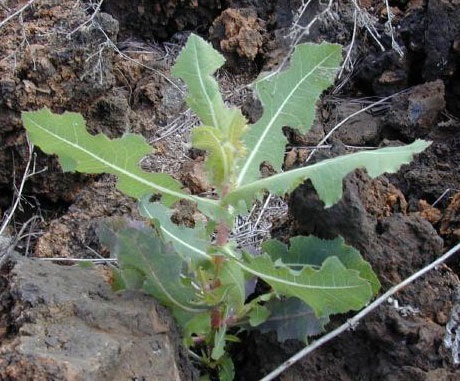 Two years of data indicate that active restoration of social trails is successful although the native plant community arising from the revegetation seed mix is not analogous to the adjacent plant communities because the revegetation seed mix is generalized to the species in all ecotypes of the Garden. Trail shape data indicate that trail improvement projects tend to widen the trails overall. Extreme weather in the second measurement year revealed serious erosion problems even after trail improvements, resulting in sediment losses to nearby waterways. 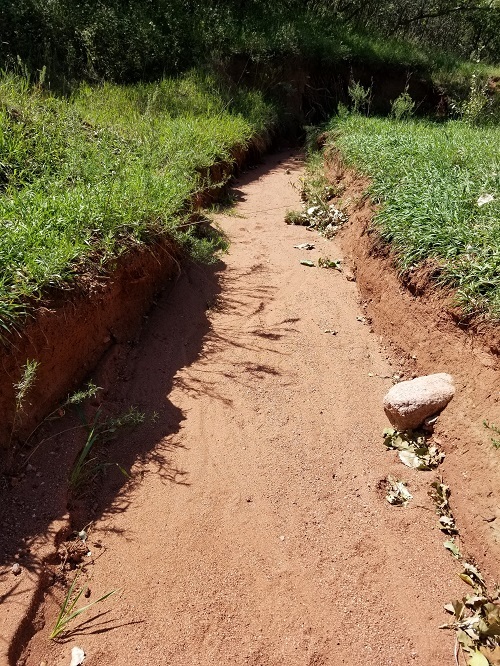 Despite sediment losses, where implemented, subsurface and surface trail structures improve trail tread, retain sediment, and provide clear parameters for trails thereby reducing resource damage in the nearby environs. Human behavior monitoring indicates 100% compliance with social trail closure when active revegetation is present. 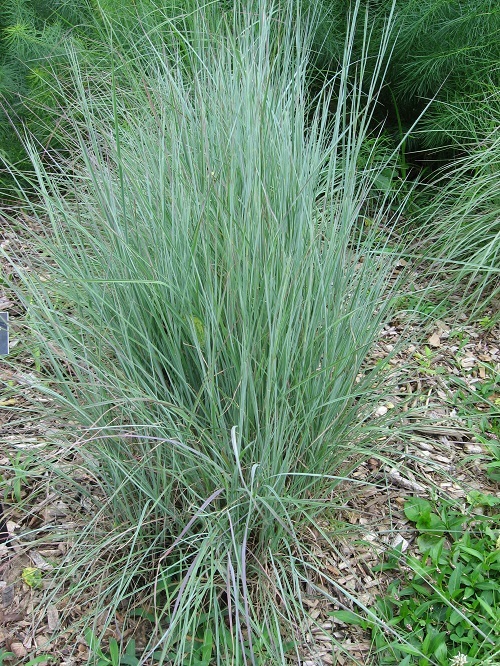 Results are more variable in locations where signage is not accompanied by active revegetation. Regarding the recruitment, retention, and scholarly engagement of the citizen scientists, volunteers have self-recruited through web presence and word-of-mouth advertising. Most are college students who are seeking local research opportunities. The flexible nature of the program has resulted in 100% retention of recruited citizen scientists, however only half of citizen scientists who express interest in the Program complete the pre-training survey to advance to training, field mentoring and participation. It may be that the pre-training survey deters participation even though the score of the pre-training survey has no bearing on the citizen scientists’ ability to participate. Citizen scientists who are college students have participate in all aspects of collegial engagement including attendance, poster design, and presentation at CSA2017 and CSA2019, literature review, data collection, data analysis, publication preparation and co-authorship. What a summer it has been. Torrential rains punctuated by periods of sunny, hot days. This abundance of moisture wields a double-edged sword. Read on to find out more. 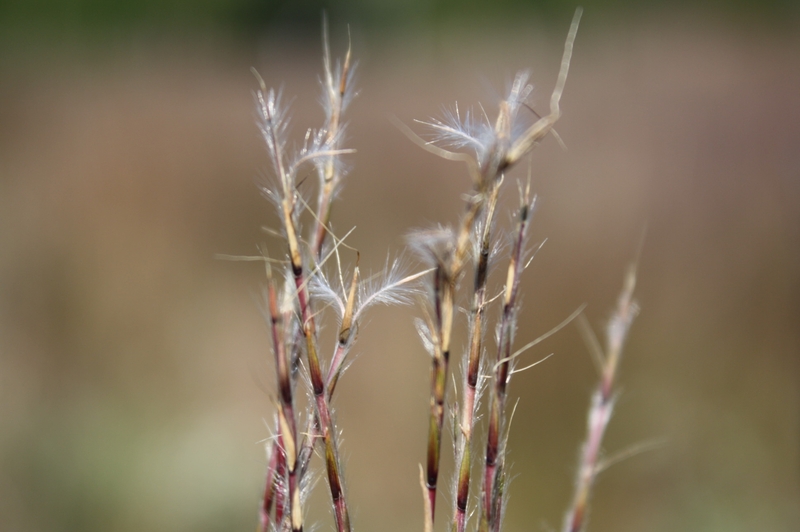 Closed social trails are disappearing on the landscape where moisture has bolstered the success of young native plants growing from our re-seeding efforts of 2015. What trail? If it were not for the stick and the sign and the slightly greater abundance of green needle in the trail surface, this closed social trail has disappeared. Notice how this trail is in the valley bottom. The sheeting moisture from the eastern upslope is clearly aiding this revegetation as its velocity slows in the valley bottom. The other closed social trail (east) is still visible on the landscape, but cover values are steadily increasing. My prediction relates to soil moisture, although we are not currently measuring soil moisture. Notice the slope angle is different here. This trail cuts across the fall line, but it is not in the valley bottom. Therefore, I predict that precipitation moves more quickly through this trail surface as it is transported down the fall line. The other potentially confounding factor is that this trail is at a trail junction where there are three viable options for travel. The closed trail is the fourth leg of this intersection. As such, this is a trail junction where going straight used to be a viable option, but is no longer. 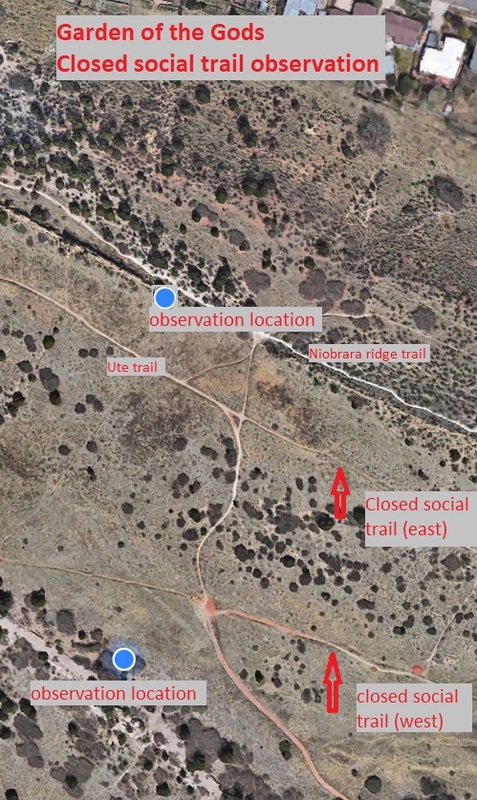 In contrast, the social trail (west) is an intersection with the Ute trail, but neither the north nor the south are viable routes (see first photos). In our first observation of how people behave when they encounter the closed social trail, our first measurement, which was taken in the middle of a Sunday in mid-70 degree weather (perfect), resulted in very little data collection. Only one party passed the closed social trail (west). They did not appear to notice that there was any decision to be made at this point in the Ute trail. That’s data! The trail did not exist in the eyes of those two people. It is worth noting that the human pressure to defy the closed trail sign is potentially different based on these geometries of each trail. The closed social trail (west) is at a trail junction as described above. While observing the social trail (east), the other monitor saw several parties. Of the seven parties, one stopped. No one took the trail. Everyone else either didn’t notice or noticed and passed on by without stopping. This is a fun volunteer activity! We sit alone in different areas to observe each trail, but we met and walked in together. We tucked away to avoid any bias that might come from a recreationist feeling “watched.” We observed for one hour. It was very relaxing. 🙂 If you would like to join, please email ecocitycoloradosprings@gmail.com. So rain has been good for plant revegetation efforts. However, on steep trails and trails with steep bedrock above them, the erosion has been staggering. Last month, I noted the volume of sediment moving on the Strausenbeck trail. Now, nearly all the sediment applied to the Strausenbeck trail in the early season is now clearly in the dry creek bed below. The bedrock is completely exposed indicating that this trail is now back to its pre-improvement condition. This presents lost management time and ecological issues downstream. Trail structures are helping, but in a sense, they are helping to wash that moving sediment off the trail surface and down into drainages. On the northern end of this trail, the trail itself is more sinuous and it is not hardened by bedrock. As a result, successful step implementation is apparent. This series of pictures depicts the trail from its highest elevation to lowest. Ditch below the trail that lines Garden Lane to the north of the Trading Post. On the Ute connector trail, the Siamese Twins trail, and the Palmer trail, there are mixed results in the same vein of what is seen on the Strausenbeck trail. There seems to be an anecdotal difference in the amount of sediment retained in step structures that have and don’t have side timbers, as opposed to just timbers at the front of each step. These improvement strategies represent dramatically different work time. However, if this weather is any indication of what’s to come in future years, we should be looking at the more constructed work specifications as they will be more sustainable over time. Timber risers are effective, but sediment augmentation to improve the trail surface is not a sustainable management technique because the sediment is moving out of the trail surface. In places where the timber risers run directly perpendicular to the fall line, soil loss is already apparent just below the newly-installed steps, like a headcut seen on an agricultural ditch with small dams. The concept from riparian ecology called hungry water is one I have been thinking about lately. Below the step (like a dam), the sediment is pulled away with the passing water. It is a bit counter-intuitive because at first assessment, the timber is clearly holding sediment, but when you trace the soil loss below a riser, it is creeping from the riser below. Maybe this is the wrong analogy. I am still thinking about it. Any conversation is appreciated. Email me! We have many new volunteers in the early recruitment stage. We always talk with folks we encounter on the trail and the word is getting around UCCS thanks to the efforts of Andrew and William, our current UCCS student citizen scientists, and my own efforts with my many students. We have completed our third quarter abiotic trail measurements. We are working on characterizing the plant community on the closed social trails as well as working on logging as much data as possible using the social trail observation protocol. If you are interested in participating, please email ecocitycoloradosprings@gmail.com. 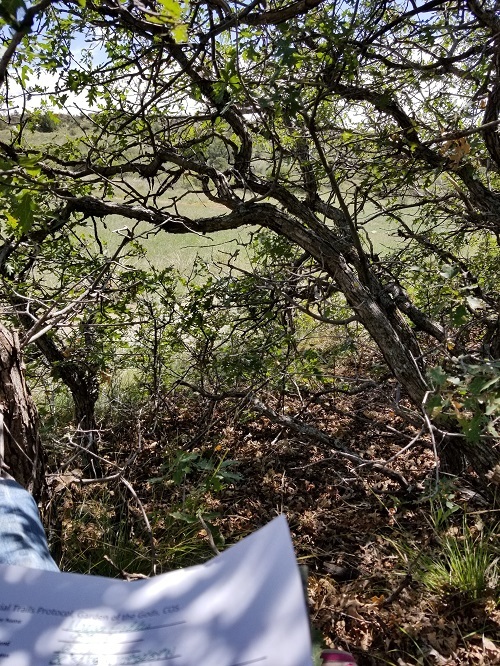 In October, Dr. Emily Mooney’s UCCS ecology students will come once again to complete the full spectrum vegetation measurements including total cover and percent cover by species. If you are interested in participating in our upcoming vegetation measurements, please email ecocitycoloradosprings@gmail.com. 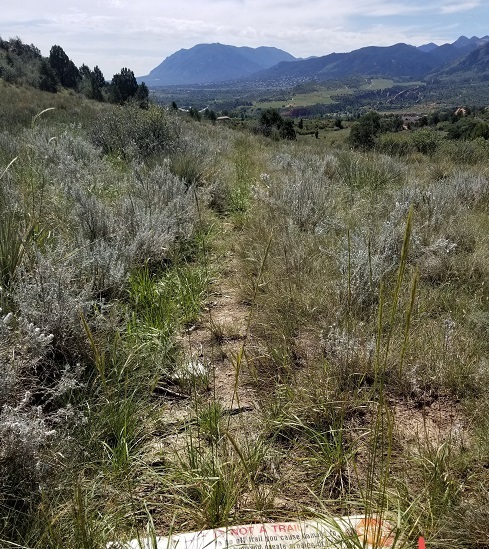 In the second quarter of 2018, we collected a second round of measurements on the Palmer Trail, the Strausenbeck Trail, the Ute Connector trail, and the Siamese Twins Trail. 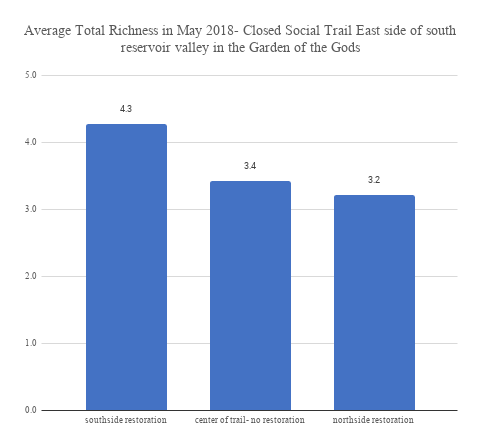 We also collected a complete set of richness and total cover data on the two closed social trails on the south end of the reservoir valley. We have not begun collecting trail user data, but these efforts will commence in time for the busiest season in the garden. We also intend to measure the Niobrara trail again in the third quarter. Our new (2018) citizen scientists Jay and Shannon are adopting this measurement effort, but all of the citizen scientists and Lee Derr have participated as it is time-consuming and challenging. Each trail is approximately a quarter mile long. 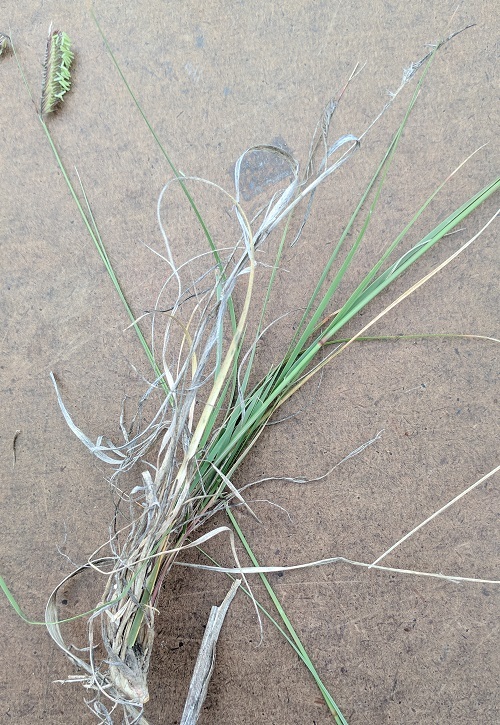 This is a short distance to cover when collecting trail dimension data, but this takes considerable time when collecting vegetation measurements. After significant trial and error, we decided to collect only richness and total cover data in the second quarter. 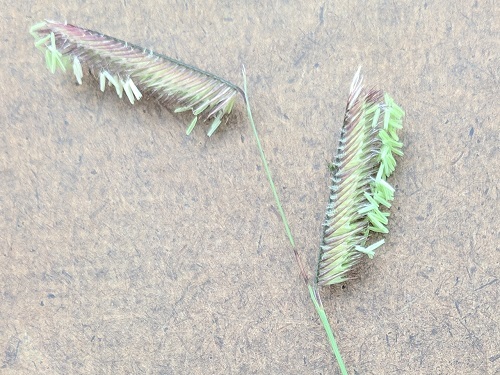 We did not feel confident enough in blades of grass to identify by species. 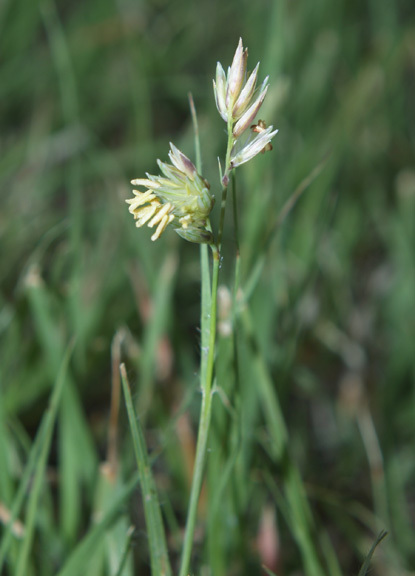 As the plants mature in the third quarter, we will be able to collect additional data about percent cover by species. 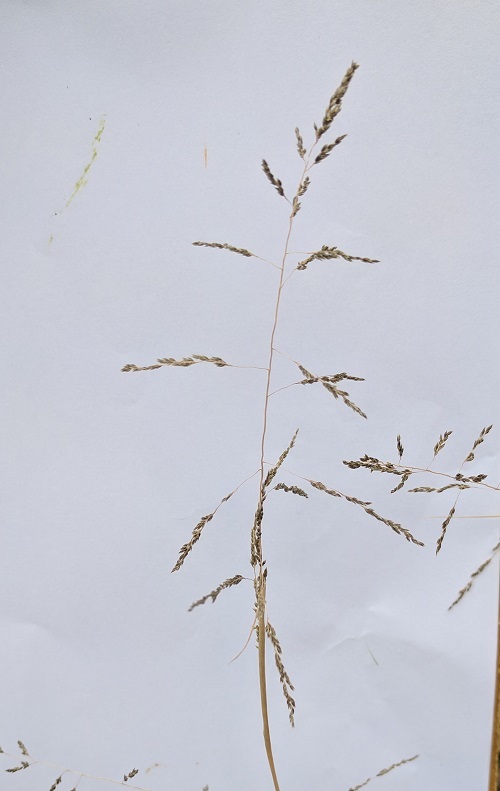 In brief, these data suggest that not all of the species present in the revegetation mix are growing in the closed trail area where it was seeded. By the end of the year, we hope to make a recommendation about what species are most successful. 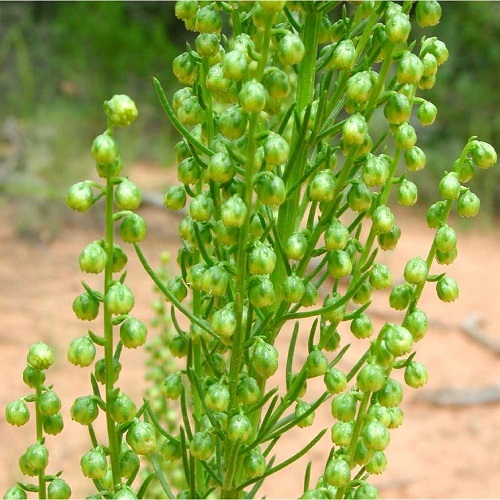 We want to find the balance between using revegetation seed that mirrors the native species composition while also minimizing costs to facilitate the purchase of more revegetation seed for use in additional restoration applications. On the four trails where we collect abiotic data about the trail shape, restoration work was completed in this quarter. 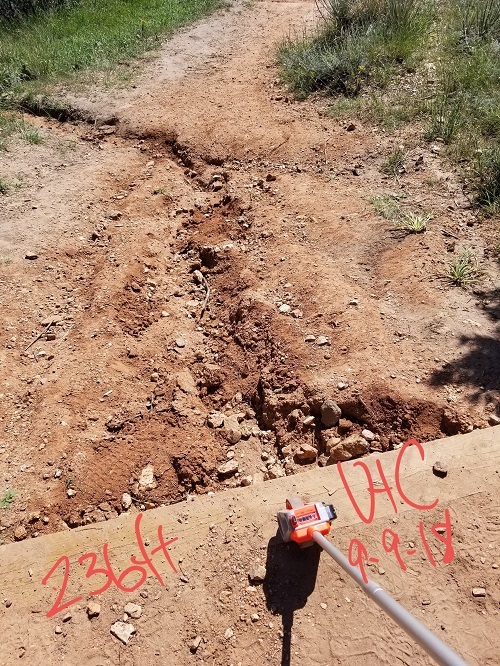 Our second quarter measurements occurred before, during, and after the trail work was completed. The third quarter measurements will capture post-trail improvement data. The most startling, although expected result from these measurements was the volume of soil loss on the Strausenbeck trail. Recall that this spring, city crews were busy adding sediment to the bedrock face of this trail. I think the perception was that something needed to be done immediately to accommodate trail users, especially horses. They were in the process of adding the sediment when we collected the baseline measurements. This complicates the interpretation of the data because the baseline was not complete before they started adding gravel. That being said, in places where we captured the trail dimension right after they spread gravel and then captured the change in the second quarter, we can conclude that over four vertical inches of sediment have already been lost. I have not calculated the volume averages yet, but I predict that we will see great change as a result of this management decision to add gravel to the trail surface. photo caption: On the Strausenbeck trail, over 4 inches of sediment have already eroded away since last quarter. The trail face is bedrock in places. This bedrock is naturally curved. Our measurements suggest that adding sediment to level the trail surface is not a long-term solution. 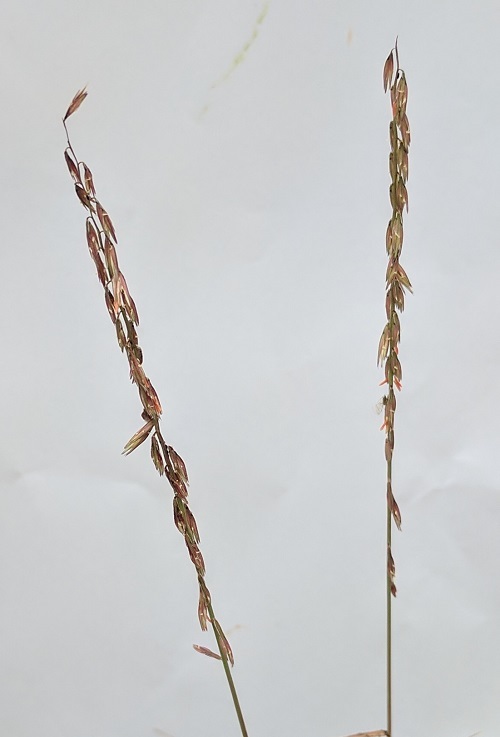 The Siamese Twins, Palmer, and Ute Connector trail measurements did not reveal any surprising numbers. It is difficult to interpret this data right now since the trail improvement projects were ongoing throughout this quarter so no set of data contains numbers that reflect only post-restoration data. 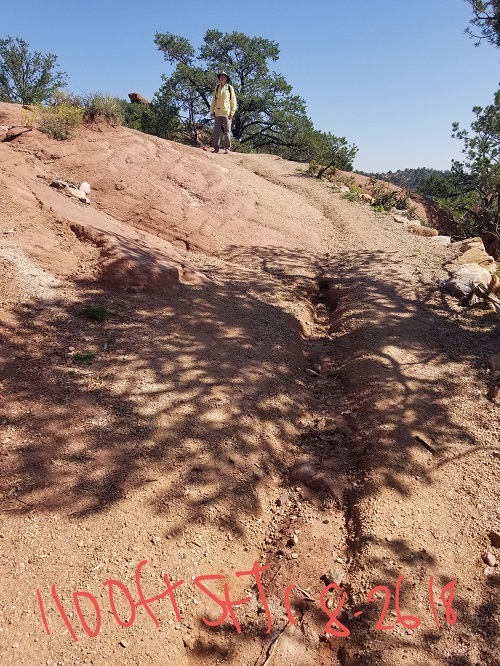 In June, we finished measurements on the two closed social trails in the southern reservoir valley of the Garden of the Gods. This is a discussion of our findings. Read May’s post to catch up on this conversation. 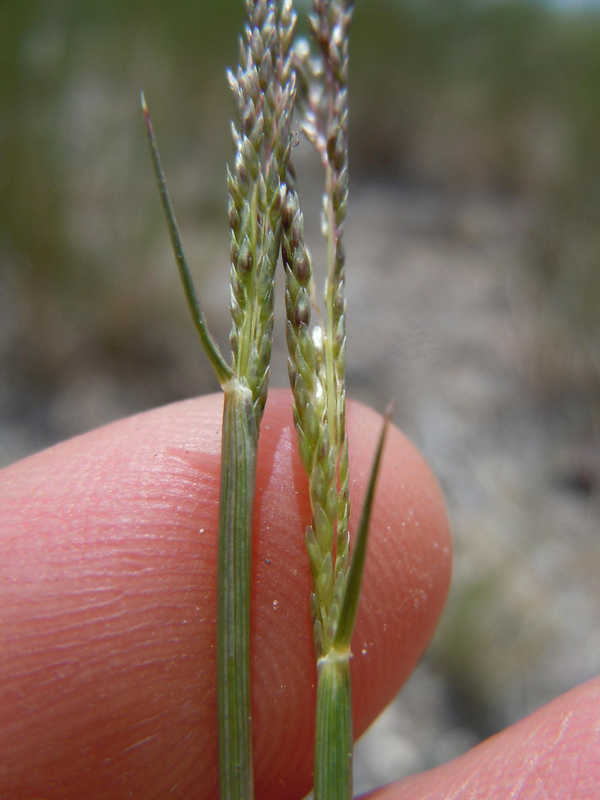 Question: On the richness measurements, is there an “ideal” species richness value? For example, in the first measurement along the east trail, the richness value was 7. The next measurement shows a richness value of 3. 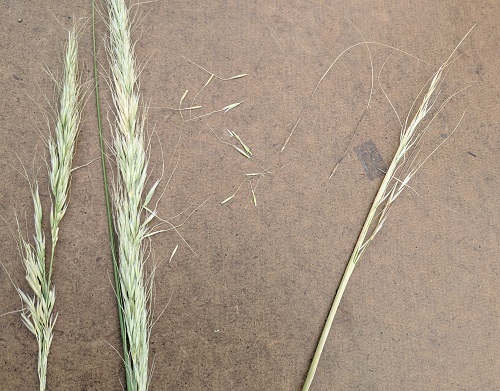 Given these measurements occurred in an area that we had restored presumably utilizing the Garden seed mix, is the richness value of this seed mix then the baseline with which we are to compare our measurements? I guess my question at the end is is a species richness value of 7 “good”? 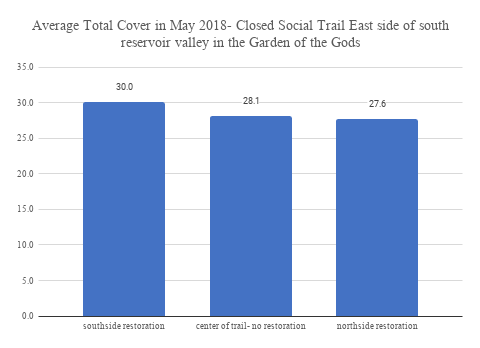 Looking at the table on the upper right in the east trail-May 2018 tab, it’s interesting that average total cover for the northside restoration area is actually lower (although probably not by a statistically significant amount) as compared to the center of the trail, which wasn’t restored/reseeded. And again, my question goes back to our baseline? Does any of your research suggest what an adequate cover value is for restored social trails after a certain period of time? I’m assuming we’d like to see something above 50%? The data in the table suggests that folks may still be accessing the closed and restored east trail from the north. Response: Regarding richness, the revegetation mix has 10 species and I do think that this is the benchmark to which we are measuring. We don’t have a lot of data yet, but anecdotally, we are not seeing all 10 species in the closed trail area. 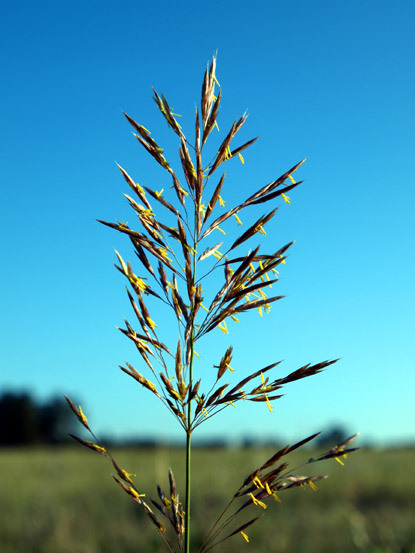 The reveg seed mix is something that Melissa McCormick researched. She consulted me when she was working on this. I think the management recommendation that might arise is one that suggests that fewer species should be in the mix, ie only the ones we are seeing, even if this means we are not reseeding all of the native species. I say this because some seed is very expensive. 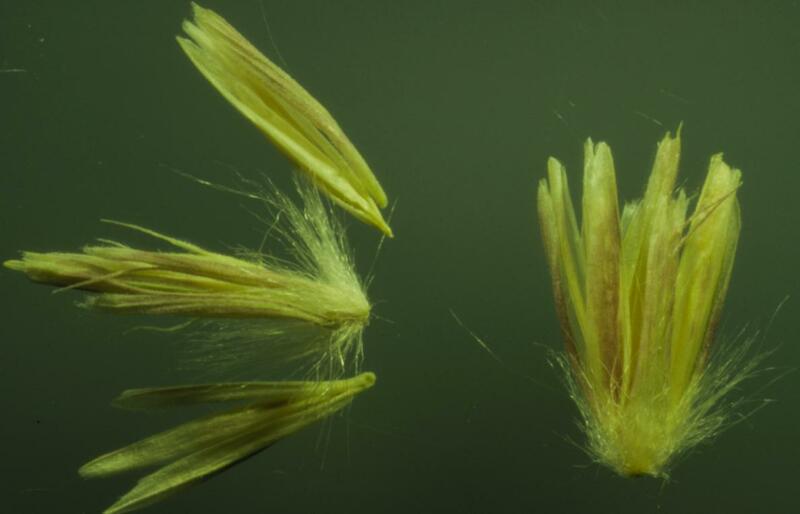 If we never see it germinate in a couple of seasons of measurement, it might not be worth the money to include these seeds. I can not make this recommendation yet because I don’t think enough data has been collected to date. 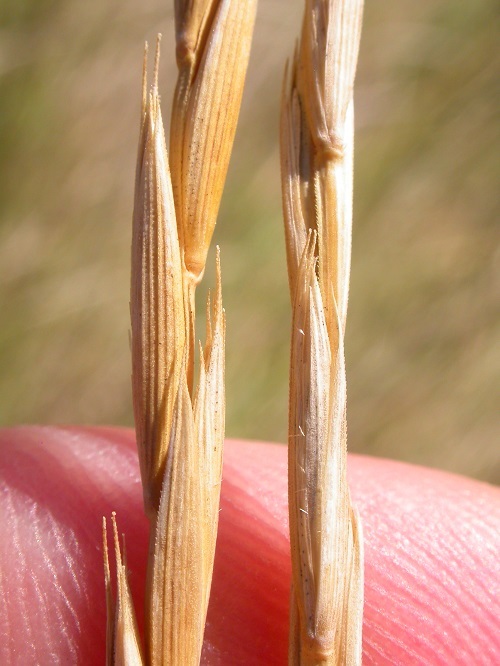 That being said, I have ideas about how we can run seed collection projects to abate the cost of restoration seed if cost becomes an issue at any time in the nearer future. Regarding the quadrants of restoration, let me lead with the caviat that I just played around with these categories a little bit. I need to spend more time after we have a mid-season measurement. 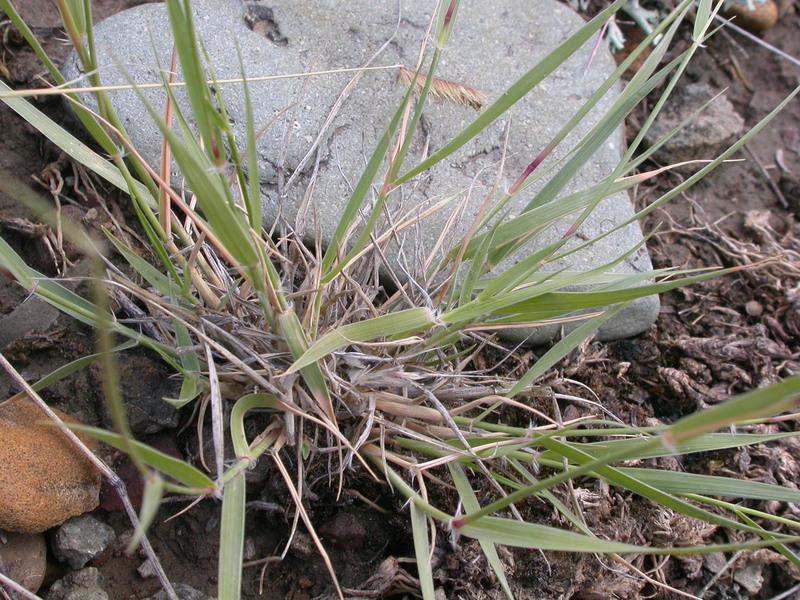 The cover you see now is not indicative of the success of the restoration because the plants are young. Let’s see what comes of our measurements in the next two quarters. Anecdotally, my impression is that the middle of this particular trail might be the sweet spot in which there is significant soil (and thus native seed) accumulation due to low slopes and no recreational impact. It is even slightly convex to hold water. 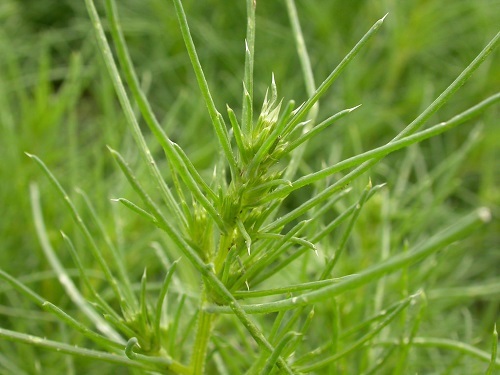 We saw wild asparagus in the middle! That is an oddity for a generally dry landscape. On the north side of the trail, there could still be some recreational impact impeding the progress of the revegetation and the landscape. The north side also has low slope is more convex, contributing possibly to a drier microsite in this quadrant. The south end is very strange, having very steep and rocky slopes, but harboring horticultural plants, which I can only assume hitched a ride on the wind over the dam. It think this is also a potentially wetter site due to humidity accumulation on the steep eastern flank and an ephemeral pond that sometimes developed behind the south dam. Long and short, there are lots of variables to look at here. The eastern trail is a great one because it showcases natural variations that might typify other management areas and trails. We can possibly use this trail and its western companion as references for other trail closures, using slope and soil moisture as potential parameters for management decisions. As of May 31st, we have accomplished 133% of last year’s total adult volunteer hours. It helps that we have three new citizen scientists this year. We introduced Tyler last month and now Jay and Shannon have completed the training. Welcome Jay and Shannon! They are Garden of the Gods neighbors, long time Colorado Springs residents, trail runners, and conservation enthusiasts. They will be leading the effort to measure vegetation on the closed social trails where restoration occurred in 2015 and before. Summer is not even officially here yet and we have measured more trails, more times over in 2018! There really is a learning curve to this. We accept that the first set of measurements is basically a practice round. However, once we get the protocol established, efficiency increases. 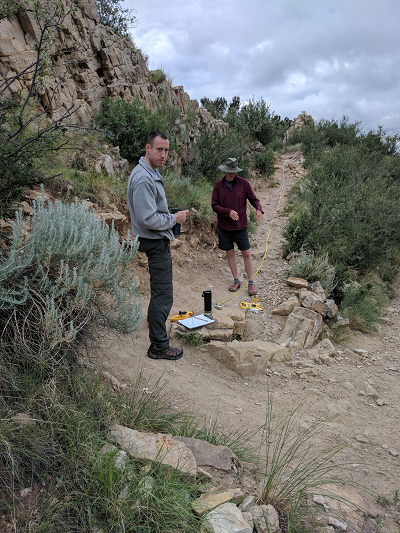 For example, in May, we measured the Ute Connector Trail, the Palmer Trail, the Strausenbeck and Siamese Twins trails for the second time in 2018. We measured the whole quarter mile of the more eastern closed social trail. We measured the western closed social trail twice, but haven’t made it to the end yet. The first measurement of the western closed social trail was an example of trial and error. 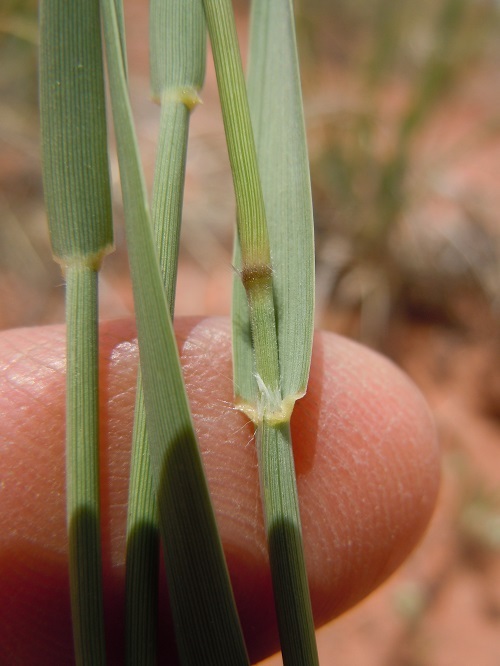 We had to start measuring to understand that species identification was next to impossible with a few blades emerging. We had a discussion about the balance of data collection and data reliability. We don’t want any questionable data in our dataset. 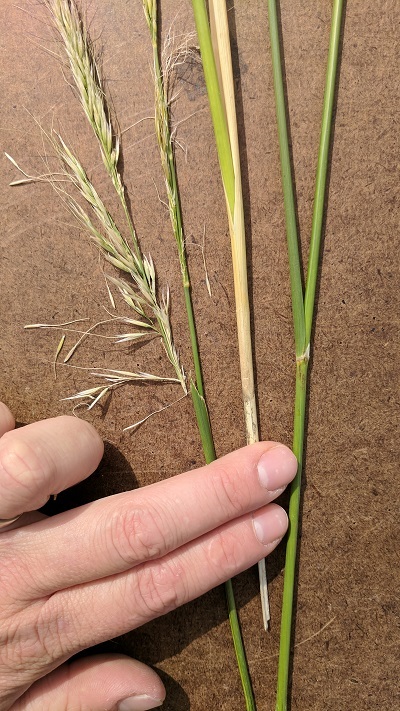 Therefore, we decided to scale back that measurement to total cover and richness, but we were so wrapped up in deciding if we could identify the plants, we forgot to measure richness! The second time around, we sailed through 200 ft of trail in less than an hour, collecting our agreed upon early season total cover and richness measurements. 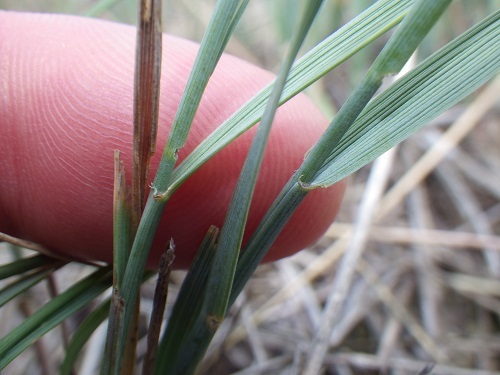 In the spring, we are reduced to decision-making by ligule characteristics…this doesn’t feel as reliable, although you would be surprised. 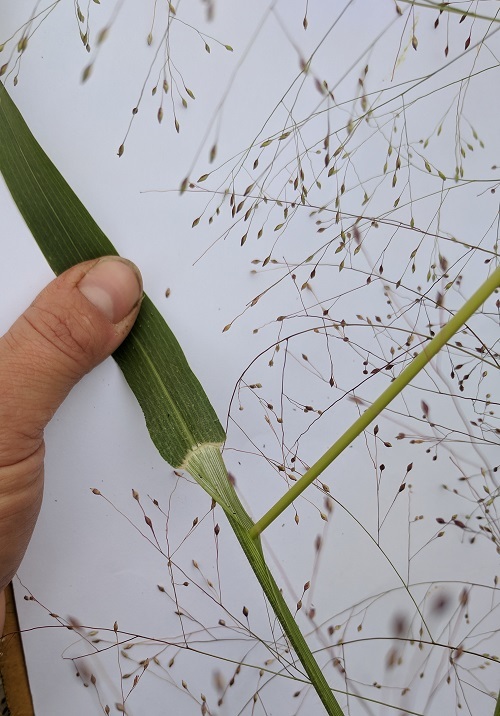 Look at those ligules pictured in an earlier post (scroll down to read more- September 2017)); they are quite distinct from each other. Regarding richness, we don’t have a lot of data yet, but anecdotally, we are not seeing all 10 revegetation species in the closed trail area. The city natural resource specialist modeled the revegetation seed mix on the native plant composition in the Garden. She consulted me when she was working on this. 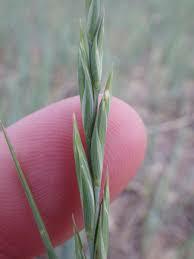 The revegetation seed composition is the ideal generalized plant community for the Garden of the Gods. I think the management recommendation that might arise from this research is one that suggests that fewer species should be in the mix, ie only the ones we are seeing, even if this means we are not reseeding all of the native species. I say this because some seed is very expensive. 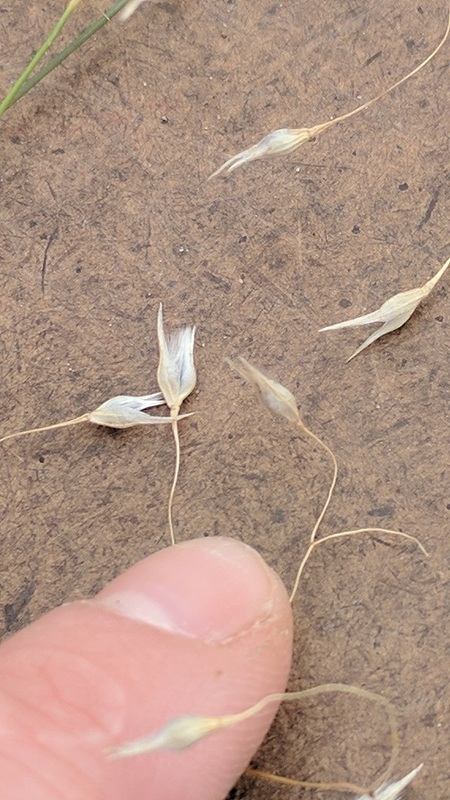 If we never see it germinate in a couple of seasons of measurement, it might not be worth the money to include these seeds. I can not make this recommendation yet because I don’t think enough data has been collected to date. 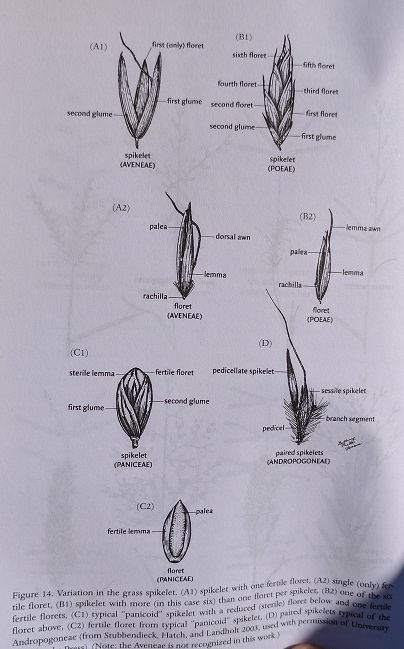 That being said, I have ideas about how we can run seed collection projects to abate the cost of restoration seed if cost becomes an issue at any time in the nearer future. Regarding the quadrants of restoration, let me lead with the caviat that I just played around with these categories a little bit. I need to spend more time after we have a mid-season measurement. 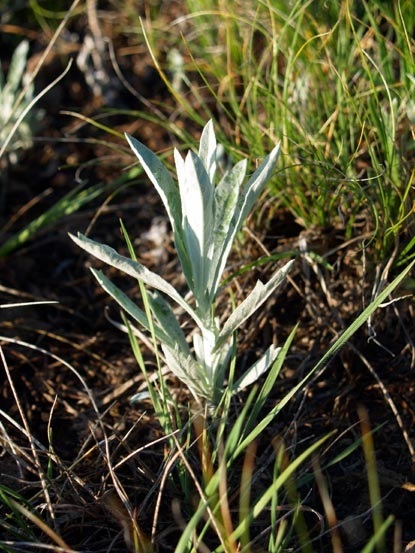 The cover you see now is not indicative of the success of the restoration because the plants are young. Let’s see what comes of our measurements in the next two quarters. Anecdotally, my impression is that the middle of this particular trail might be the sweet spot in which there is significant soil (and thus native seed) accumulation due to low slopes and no recreational impact. It is even slightly convex to hold water. 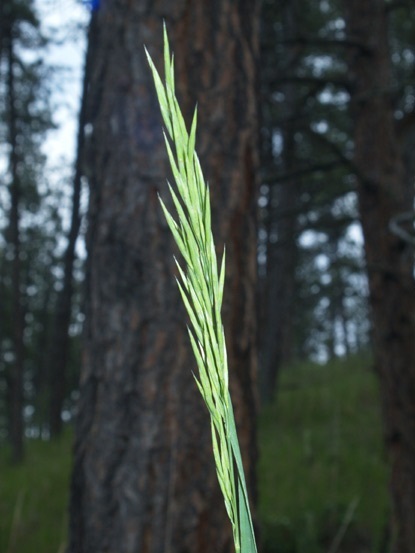 We saw wild asparagus in the middle! That is an oddity for a generally dry landscape. On the north side of the trail, there could still be some recreational impact impeding the progress of the revegetation and the landscape. The north side also has low slope, but is more convex, contributing possibly to a drier microsite in this quadrant. The south end is very strange, having very steep and rocky slopes, but harboring horticultural plants, which I can only assume hitched a ride on the wind over the dam from the neighborhoods on the other side. It think this is also a potentially wetter site due to humidity accumulation on the steep eastern flank and an ephemeral pond that sometimes develops behind the south dam. Long and short, there are lots of variables to look at here. The eastern trail is a great one because it showcases natural variations that might typify other management areas and trails. 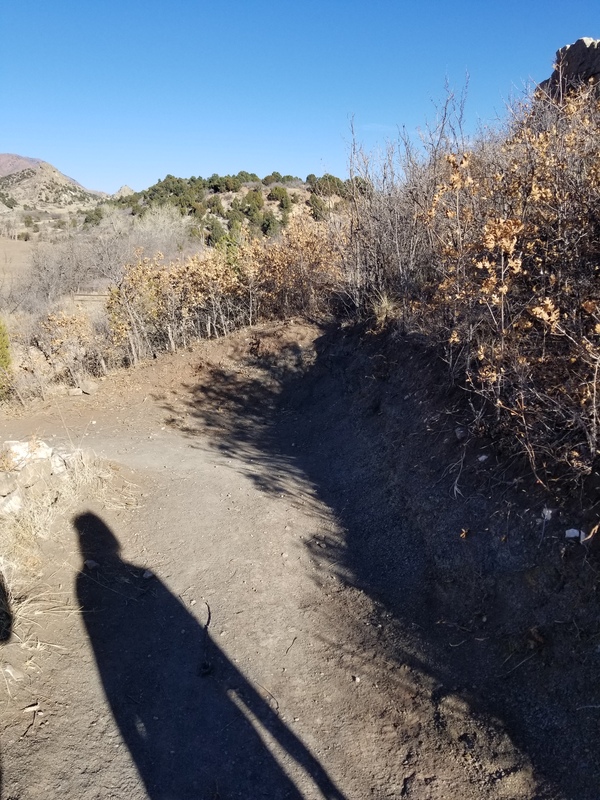 We can possibly use this trail and its western companion as references for other trail closures, using slope, aspect, and soil moisture as potential parameters for management decisions. 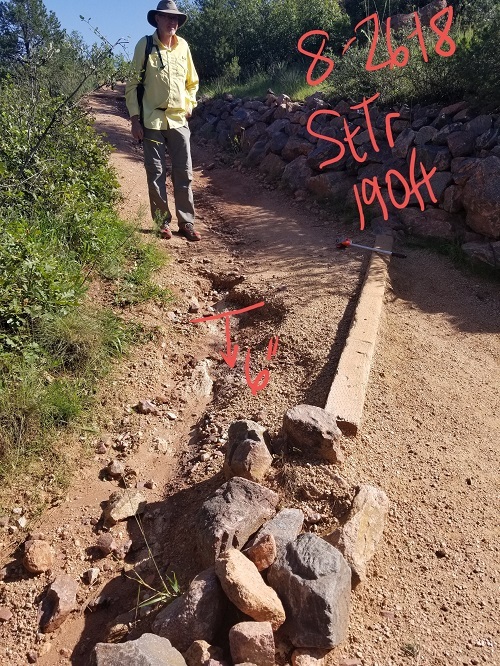 Below you will see our photo point series from before the trail improvements on the Ute Connector trail. The trail improvement process involves removing dysfunctional structures. Sometimes, they are replaced by subsurface structures on some trails. These subsurface structures slow the movement of sediment down the trail, or so we think (the research we are doing has never been done before). Sediment is brought in to increase the trail grade as is feasible. Drainage structures are constructed to move water off of the trail surface as quickly as possible. Next month, we will post the photo points from after the trail improvement project. Our 2017 data show that these efforts lead to wider trails with less surface variation (see Niobrara Report attached in December 2017 post). Textbook trail grades and backslope angles are impossible on old trails like these, but we can do something to improve the recreational experience and the slow the rate of resource degradation. That is what we citizen scientists are doing out here. Our purpose is to provide the data to characterize the effectiveness of these trail improvement and restoration efforts. Anecdotally, the trail environment is improved immediately. The trail is easier to walk on! Our data will tell us what happens over time. 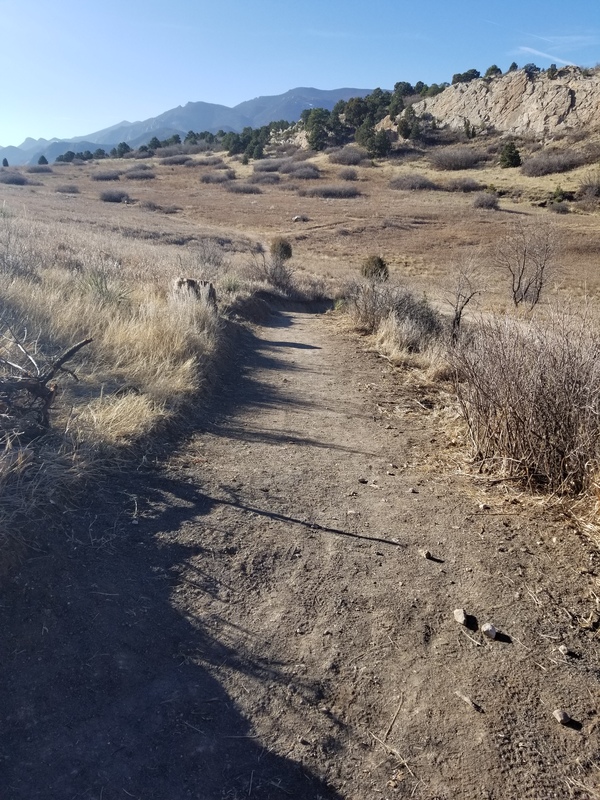 On a recent walk and talk with RMFI staff and Board, we discussed the myriad issues arising in the debate about whether trails should be re-routed or improved. Clearly, the wildlife are coping with our presence in the park. I almost ran into a buck one evening on the Ute Connector trail on a full moon walk with my children. We hurried back to the car and I was scolding myself- “Maggie, you dummy, that’s the wildlife valley!” Then the other morning, Andrew and I were gearing up to measure the Ute Connector trail when he spotted a bobcat. I thought I might see one someday, on the far western side of the Garden. No! Here the bobcat was, trotting around on a knoll above the second-busiest parking lot in the Garden. The animals know where we are and where we are not. If we move, ie move a trail, will that perturb them more than the on-going degradation of their ecosystem caused by the design of the historic trails? There are currently no answers to these questions, but our efforts will lend quantitative data to this discussion. In the first quarter of 2018, I worked with the RMFI staff to identify trails of monitoring interest. We reflected on the feedback received in 2017. The Citizen Science Program concept was received well at the end of 2017 and thus we agreed to expand the Program by including more trails. 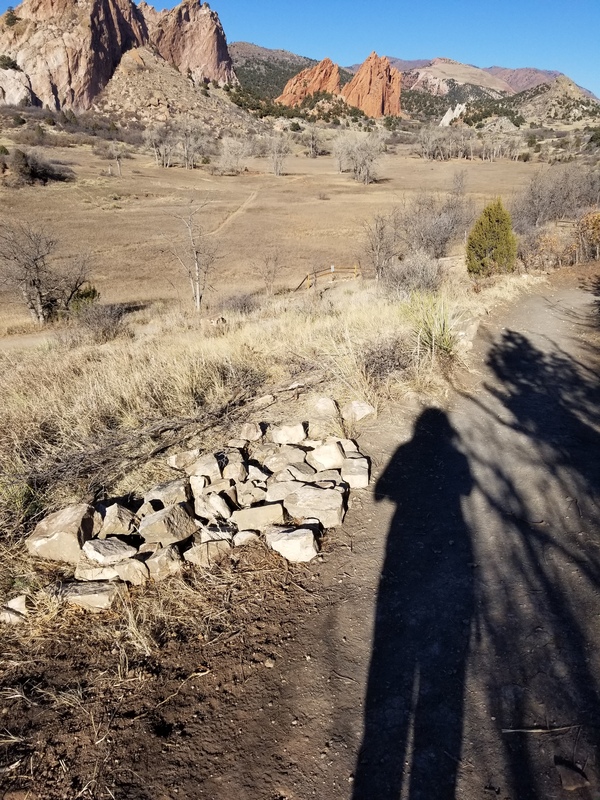 All trails are in the Garden of the Gods in 2018. The potential for additional sites is there, but we agreed it was best to focus our attention on the Garden. A question remains- how do we know that people are staying off of the closed social trails? The ecological response is that we know they are staying off of the trails because the plant community is rebounding, as evidenced by the analysis of 2017 data. We still need to understand how humans interact with these closed social trails. As a result, we agreed to include one new human monitoring protocol. I will work on these methods in the coming month. Loosely described, they involve a timed observation from a nearby blind from which a citizen scientist will count trail users, their mode of travel, and their behavior when they encounter the closed trails. Of interest is the potential variation in human behavior depending on the type of trail closure sign used, if any at all. The trails of interest for 2018 include both 2015 trail closures in the southern reservoir valley. We measured the more eastern trail in 2017 and now we will also measure the other trail to the west of it that runs straight through the middle of the valley. 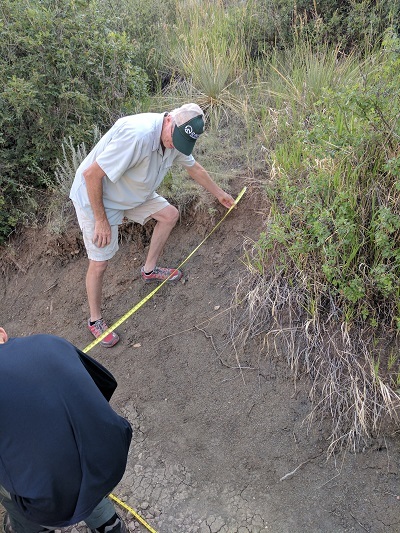 We are also measuring the Niobrara trail from 2017, the Strausenbeck trail, the Siamese Twins trail, the Ute Connector trail, and the Palmer trail from the main parking lot to Lot 5. Excluding the Niobrara trail, these are all trails with planned work in 2018. We retained all three of our citizen scientists from last year, Larry Bogue, Andrew Rippe, and William Brown. We have one trained new citizen scientist, Tyler Clinton, with four others in the training process. Our new volunteer, Tyler, is an American Military University undergraduate student. We have all gone out several times together this March. Each returning citizen scientist will be the mentor for their chosen trail. Larry is taking Strausenbeck, Andrew will have Siamese Twins and Ute Connector since they are the shortest sections, and William will lead the Palmer trail efforts. New citizen scientists will work with one of these gentlemen until their skills are strong. As always, I attend every field measurement event possible, but I have given Larry, William, and Andrew permission to measure without me. When I attend, my role is quality control. I often record the measurements, but my goal is to make sure the volunteers can collect reliable data without my physical assistance. I created a recruiting poster, which I disseminated to my professional network. I joined the Friends of the Garden of the Gods in 2017 and I will be a guide for the nature hikes in the Garden on Fridays at 10am. I want to deepen my relationship with other volunteer opportunities at the Garden to promote awareness of the Citizen Science Program. In the next quarter, I will develop the measurement protocol for the social trail closure-human interaction monitoring. I will continue to work with our trainees and finish the photo point galleries. Our citizen scientists will measure the Niobrara trail and work on slope measurements on each of the restoration monitoring trails. Our goal is to measure each trail quarterly, so another round of monitoring will occur on all trails as well. The only measurements that will occur only three times per year will be the vegetation monitoring on the closed social trail. 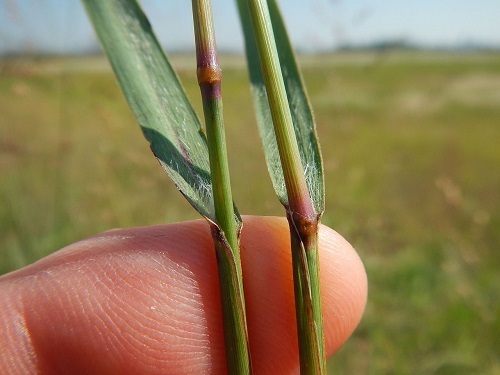 Thus, we will take our first vegetation measurements in the next quarter. Our citizen science team is growing and we have a much bigger task this year. 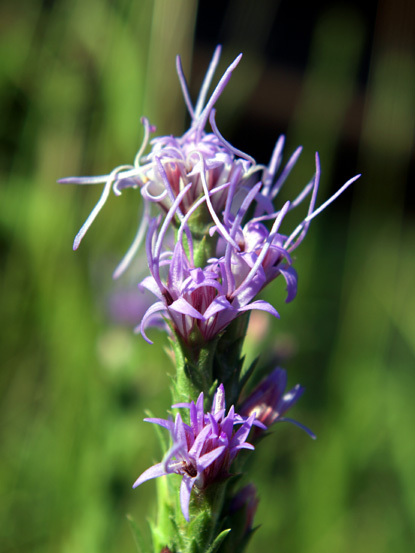 All efforts are in the Garden of the Gods and include the measurements of the social trail and Niobrara trail from last year, and the following new monitoring efforts where RMFI volunteer crews will work this summer: Palmer trail, Strausenbeck trail, Siamese twins trail, Ute connector trail, and the other closed social trail in the southern reservoir valley. The following slideshow contains the photo points for the first half mile of the Palmer trail. Want to take a walk on the trail? Watch this slideshow. p.s. after the slideshow, check out our recruiting announcement. Join us! Here are two more presentations of photos. In these two, the significant feature photo accompanies each photo point. Let me know which works best for you- the slideshow in the blog, or the link below to the presentation. Here is the final report for the Niobrara trail measurements, including both before and after measurements. And here is a brief video of the transition from un-restored to restored trail. As you can see, the trail is wider, but it is flatter. This provides a better user experience on the trail. Time shall show us the pattern of erosion post-restoration. I’ve been hiking in the Garden waiting to see some restoration work on the Niobrara trail. Then, voila! Done. The work was accomplished using a bobcat, making for quick work. The restoration effort covered the lower 200ft of trail. The bobcat smoothed the trail surface. In the process, some backslope contouring occurred. The latter is of some concern as the soils are highly erodible and any contouring that removes vegetation compromises the stability of the soil. Bikers high-banking around the switchbacks is already visible only weeks after the restoration effort. That being noted, the trail experience for any user type is greatly improved. Photos- the new trail surface is wider, but less deep. The views from the top of Niobrara ridge are amazing. In preparation for the scheduled restoration work on the Niobrara Trail, I took one more set of complete measurements. I also prepared this report for the RMFI Board. The Board approved the continuance of the Program for 2018. The plan is to continue measuring in the Garden of the Gods, but to increase the trails measured to 5-6 trails. These will be trails with future restoration scheduled that involves subsurface structures or social trail closure. The UCCS Ecology Field Methods course taught by RMFI Board Member Dr. Emily Mooney is heading out to collect advanced plant measurements on the closed social trail (2015) in the Garden of the Gods. This trail is an excellent research study site for several reasons. The trail was restored on both ends, but the ecological conditions along the trail change from the north end to the south end. 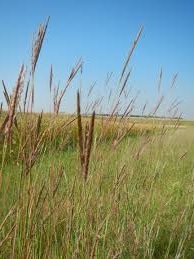 The north end is amidst a mature native grassland with excellent soil development due to its relatively flat geography. As the former trail extends southward, the aspect (S-S/W) remains constant, but the slope increases dramatically until the former trail reaches the dam on the south end of the reservoir valley. At this end, there is little topsoil and rocky, eroding basement materials from the Niobrara Ridge formation. In addition to the ecological gradient, the former trail represents a gradient from active to passive revegetation. Approximately 1/3 of the former trail was restored from either end, leaving the middle 1/3 untouched by restoration workers. The restoration components include decompaction, raking, seeding, mulching and transplanting into the former trail surface. 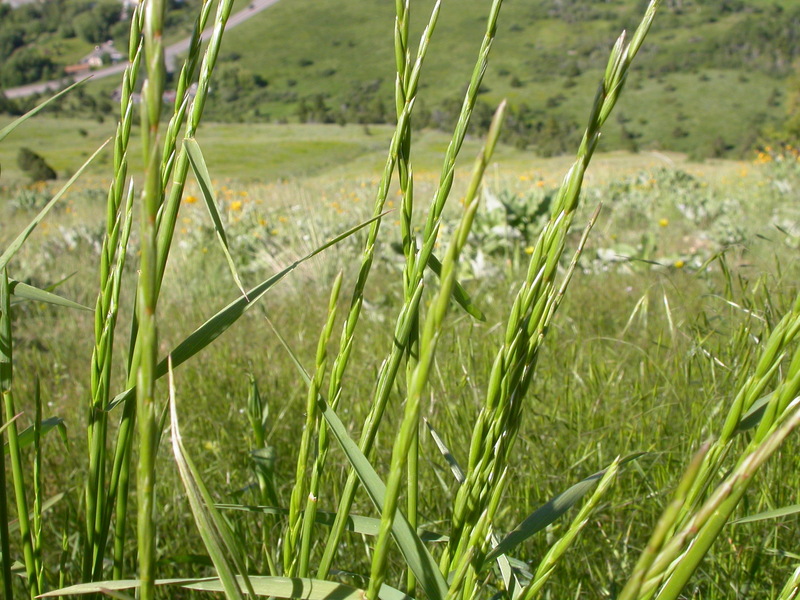 The passive areas saw no such restoration disturbance. Thirdly, the middle section of the former trail has no trail intersections, while either end of the former trail is a junction of foot and bike traffic. As such, it is assumed that the middle third of the former trail experiences decreased pressure from introduced species. I write this in advance of our extended study because these are the assumptions upon which we enter the data collection process. We intend to collect measurements of richness, total cover, and partial percent cover per species in randomly spaced quadrats along the trail, starting from the north end of the trail and working inward toward the middle section of the trail. Regarding your demeanor while conducting research, do not walk in the former trail. Don’t walk right next to it. Whenever and however possible walk in an indirect path, not following your partner through the study area. We don’t want to cause disturbance by conducting research. The best way to avoid this is to disperse our foot impact and make sure our backpacks are on a hardened surface and not all piled up together in one spot. 1. What is the richness within the quadrat? Richness is a measurement of how many different species are present in the quadrat. You needn’t know what they are to count them. Simply count with your partner how many different species you see. Do not collect any specimens from within the plot. Record the richness in the datasheet. 2. What is the total cover in the quadrat? The quadrats are divided into equal subcells. 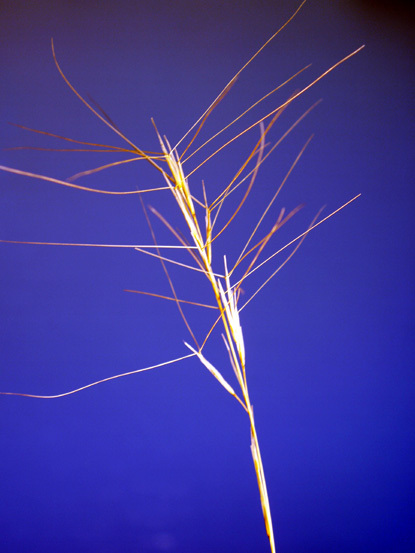 The subcell is a “hit” if there is a plant rooted in it. 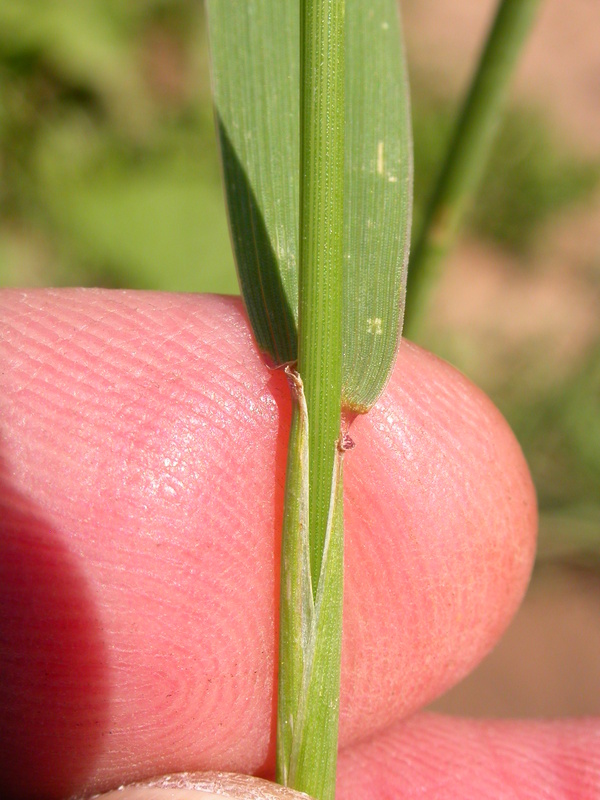 Count the subcells with plants growing in them. Divide this number by the total number of subcells in the quadrat. This is your total cover. Each citizen scientist in the team will do this independently and quietly. When the counting is complete, they will share their findings. If they agree, the measurement is complete. If their measurements differ, the counting process should begin again. In the second round, they should count each subcell together to reach an agreement. Record the total cover in the datasheet. 3. What is the partial percent cover in the quadrat? 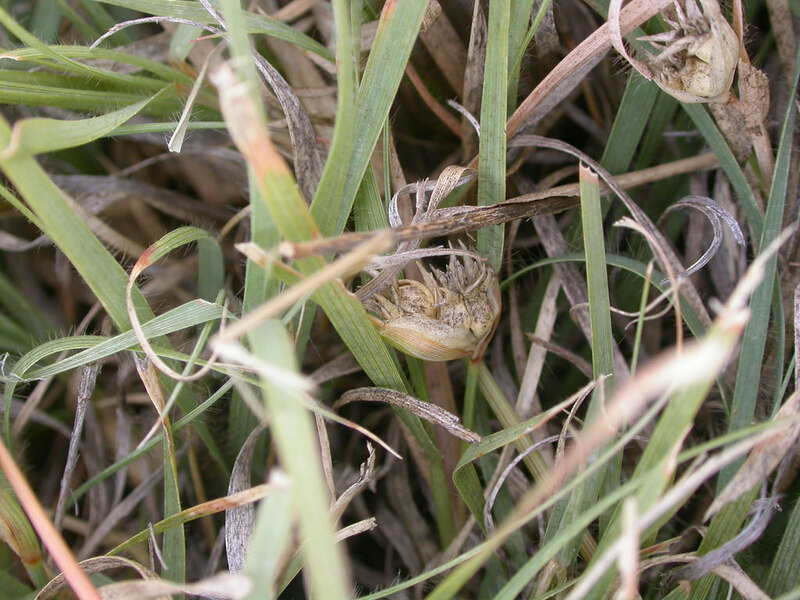 After the total cover is determined, the same process ensues per species identified in the first step. To do this, you need to know what the species are that you counted in your richness measurement. 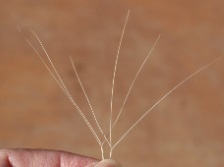 Use the field guide that follows to aid this process. 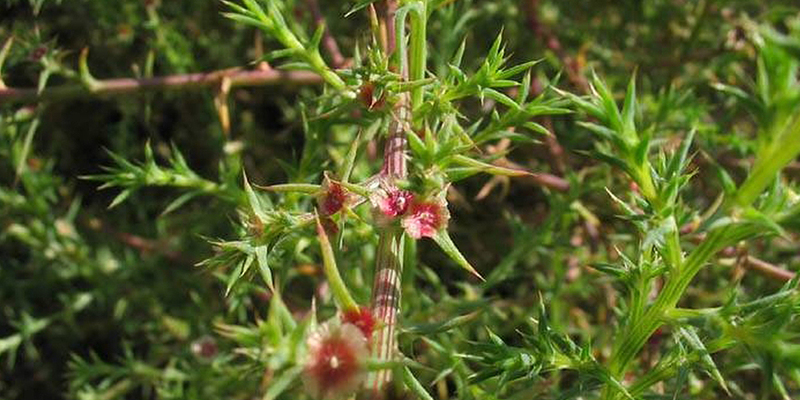 Citizen scientists have already completed a rudimentary plant inventory upon which this plant guide is based. Use the dropdown menu in the datasheet to locate the species. Then record the percent cover, which is the total number of subcells containing the rooted species divided by the total number of subcells in the quadrat. If you encounter species not present in the dropdown menu, please let me know and I will resolve this for you. Repeat the process for every species present in the plot. Take a photo of your quadrat. Upload this to the datasheet and submit it. Start a new datasheet for every quadrat measured. We collected baseline measurements on the Niobrara trail (abiotic trail measurements) and on a closed social trail in the south reservoir valley. Both trails are in the Garden of the Gods. Collecting the pilot trail measurements was a complex process. We first collected easy abiotic trail measurements on the Lot 9 connector trail. We used the citsci.org web form datasheet. That was reasonable enough, but when we got to our main trail of interest, the Niobrara trail, we found that the datasheet I created wasn’t detailed enough to capture the information we wanted to record. This complex trail has lots of switchbacks. We actually ditched the datasheet and started with a blank piece of paper, from which we developed a new datasheet in excel. Yes, that means we temporarily abandoned citsci.org. I will be at Colorado State University (CSU) in a month to meet with Greg Newman. We will get it back online. 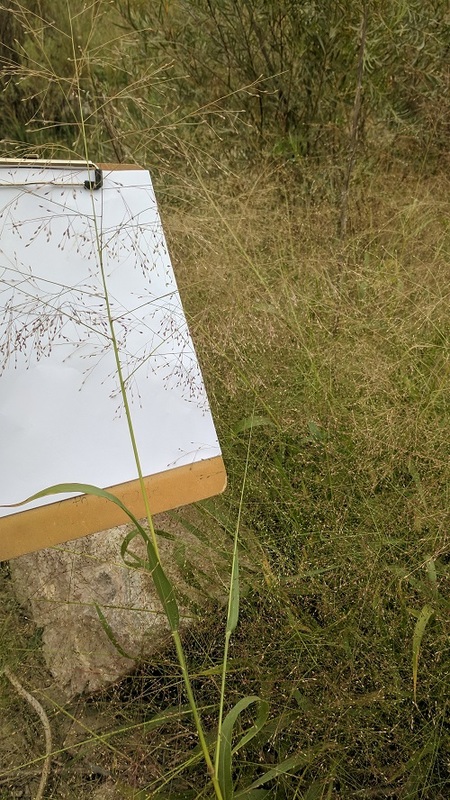 It is interesting to note that the volunteers ranging in age from 20-60 (ish) said they prefer to use a clipboard, paper, and pencil rather than enter the data into the web form while standing on the trail. This includes me. 🙂 So we have clipboards. We agreed that we needed a permanent pin to mark our measurement points, but then it rained for a month straight and the pins moved. Erosion. It will be okay though. When RMFI crews work on the trail, those specific points will disappear. It is really the longitudinal measurement that stabilizes the measurements on the ground. We are measuring to understand the change in depth and width over time; those measurements are the dependent variables with regard to our research questions. The width and depth depends on the trail design and restoration efforts, environmental factors like aspect and slope, and recreational patterns. It is now time to take the second round of measurements on the Niobrara trail. If you would like to join us, please be in touch. Photo caption: Andrew and Larry measuring the Niobrara trail in advance of planned restoration work. 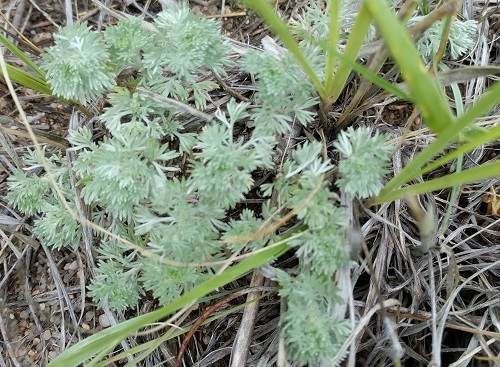 We also collected the pilot vegetation measurements on the closed social trail at the junction of the Ute trail and the Niobrara connector in the south end of the reservoir valley. This social trail was closed in the summer of 2015. This was a measurement vacation! It was so easy in comparison to the trail measurements. We counted 18 unique species (richness) in the closed trail area. We were pleased to find significant coverage in just two years. After completing these measurements, we decided to modify the data collection technique. We were looking at total cover in the quadrat using the parameter that any living plant matter in a cell in the quadrat was a hit for the cell. In places where there was an incised bank on the edge of the trail, the vegetation from the sides leaned into the measurement area. Thus, we were recording 100% cover in every quadrat even though we could clearly see that there was nowhere near 100% cover at soil level in the trail area. We decided it would be more informative to count only the squares in which vegetation was rooted to the ground since we specifically care about the revegetation of the closed trail area. This shift is a simple adjustment. 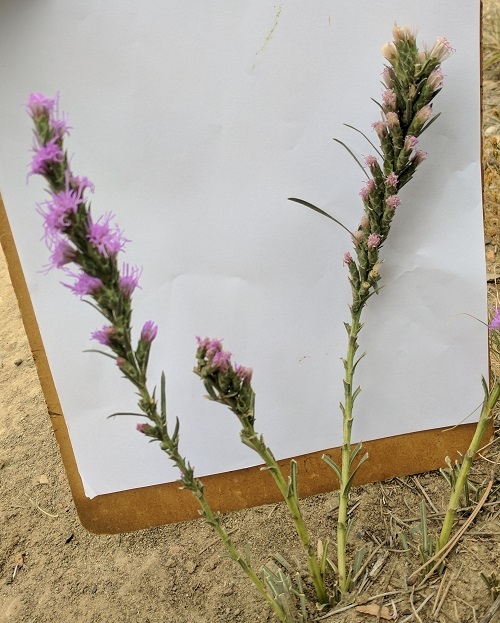 We also spent time preparing plant samples to inform future citizen scientists of the expected species in the nearby environs and native revegetation seed mix. 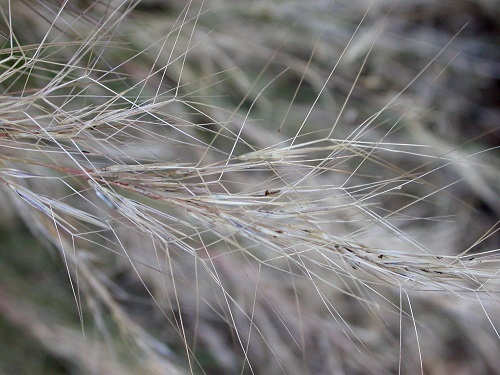 The results of this vegetation data will inform land managers of the success of each species in the revegetation seed mix, which is composed of expensive native seed. We will repeat these measurements each month. Contact me if you would like to participate. 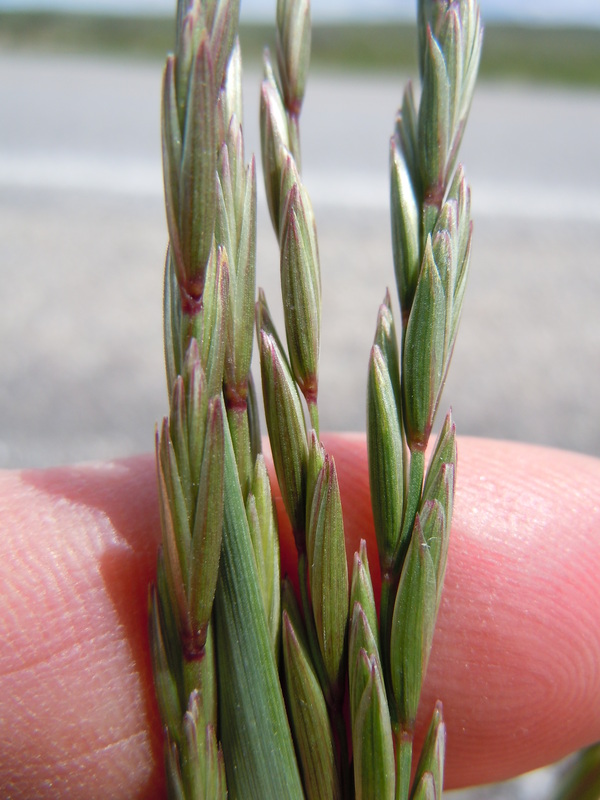 Nassella (or Stipa) viridula Crotalus Grass ID involves a lot of vocabulary! 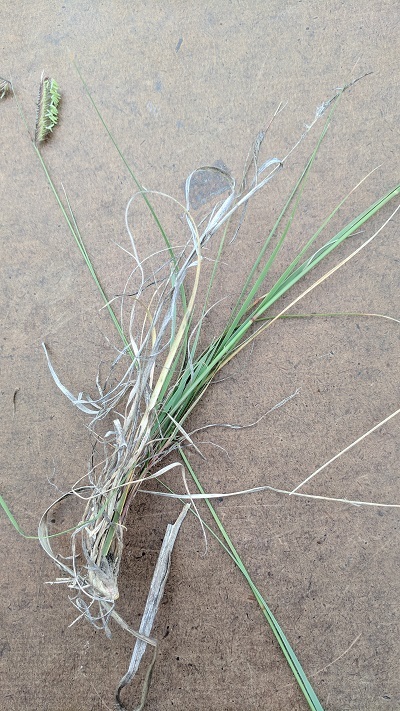 Caption: We collected one plant sample per species present in the closed trail area (the study area). We collected from the adjacent plant community. 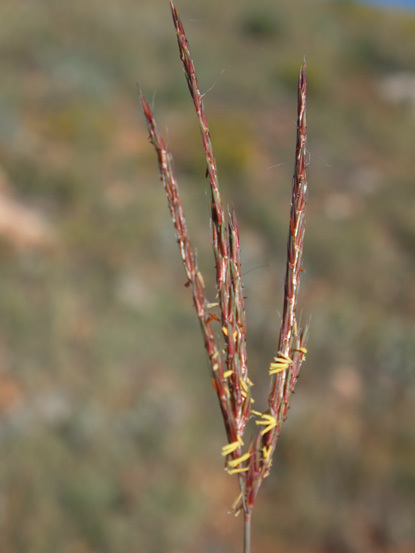 If a plant was rare, like this Ratibida, we just took a photo of it. 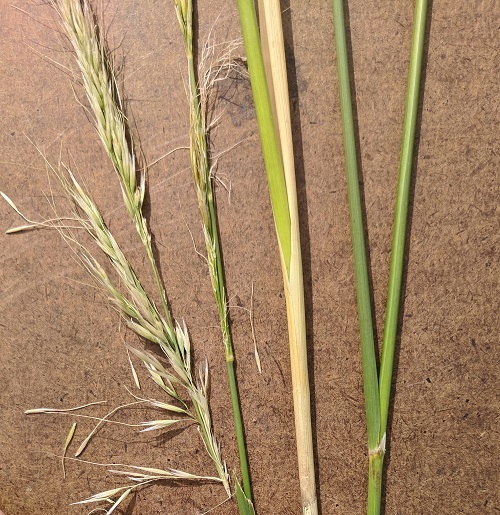 We are in the process of photographing all of the species present, highlighting the inflorescence, the sheath, and the nodes for identification training. Larry and I saw this rattlesnake at Rock Ledge Ranch on our way to the measurement site. We have three citizen scientists who are students from the University of Colorado – Colorado Springs (UCCS) geography department. They would each like to do independent projects in addition to participating in the basic measurements designed for the program. These include GPS applications, social inventories, and advanced botanical inquiries. They are in the process of developing proposals for the research they would like to do. Once their plans are approved, they will gain research intern status. 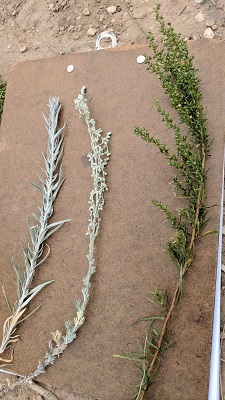 During the fall semester, two cohorts of ecology students, one from UCCS (Dr. Emily Mooney) and one from Colorado College (CC) (Dr. Emilie Gray) will come to the Garden to collect measurements. 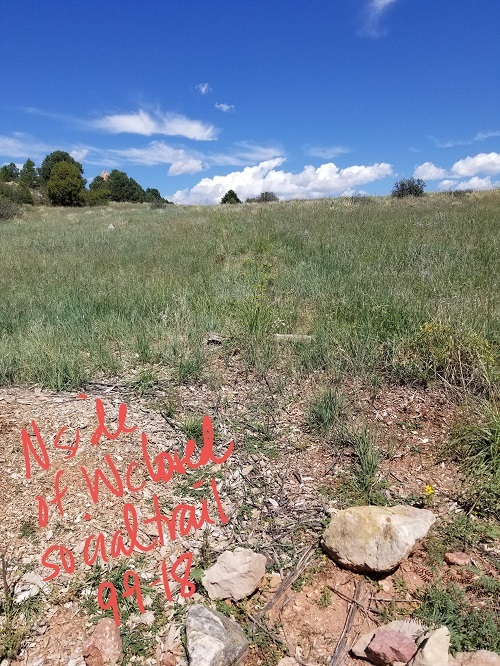 The CC students will work on mapping and the UCCS students will take social trail closure revegetation measurements, including percent cover by species, a task not currently accomplished by the citizens scientists who collect only richness and total cover measurements in plots. It is important to note that prospective participants are finding us on the Internet through the RMFI citizen science webpage or through Youtube where they see the instructional videos. I even had one candidate applying for a faculty position at UCCS contact me. He wants to propose an anthropological research component to the RMFI citizen science program in his application materials. The first cohort of volunteer citizen scientists are trained and ready to begin their first field mentoring day. We will head this Friday to field-test our measurements. Although I have taken all of the measurements by myself to proof the concept, I guarantee the volunteers will find improvement. This first cohort includes two geography students from UCCS who found the program on the Web on their own. This proves the concept that technology reaches younger volunteers. Research Intern Jaxon Rickel and I attended the Citizen Science Association international conference in St. Paul, MN. We met many of the leading authors in the field, including a great cohort of citizen science researchers right here in Colorado, and the seminal author Dr. Bonney from Cornell University. Jaxon and I presented this poster, which generated great conversation about the intersection between education and citizen science. We have already received several inquiries for participation in the training research. The citizen science program is fully designed and ready to launch! We have one detail to finalize before we are ready to start training citizen scientists and collecting data. Watch this introduction video to learn more about the program. If you are interesting in being trained, please contact us before watching the rest of the videos. 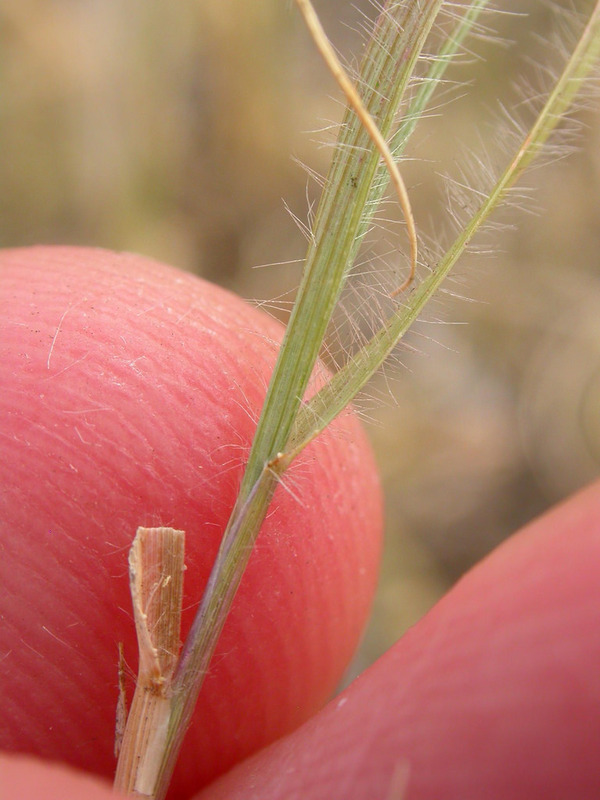 The Rocky Mountain Field Institute has a Citizen Science page now. Please visit! As of September 2016, the proposed citizen science program is officially Board-approved! We already have a research intern, a Colorado College student. So exciting. I will keep you posted on all the exciting updates.